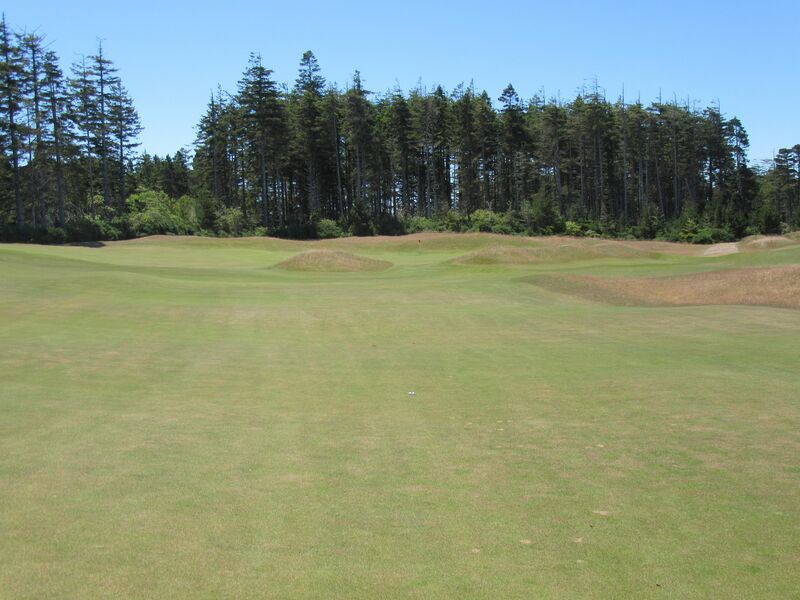 Anyone can understand why Old Macdonald is such a polarizing golf course to the everyday player. 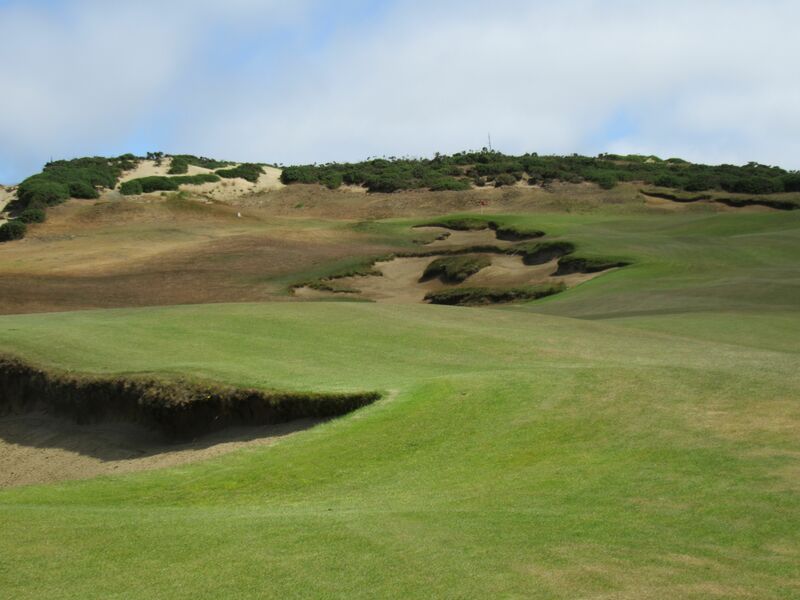 If you want only to play coastal courses, then Old Macdonald will not be your favorite track at Bandon Dunes Golf Resort. 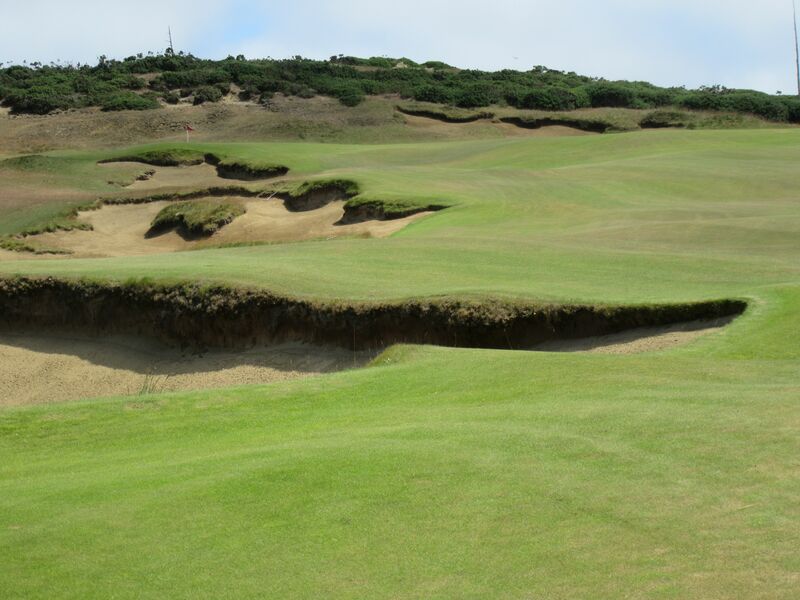 If you appreciate world-class classic course design, though, and have a general appreciation for the heritage of the game, you will love this Doak/Urbina masterpiece! 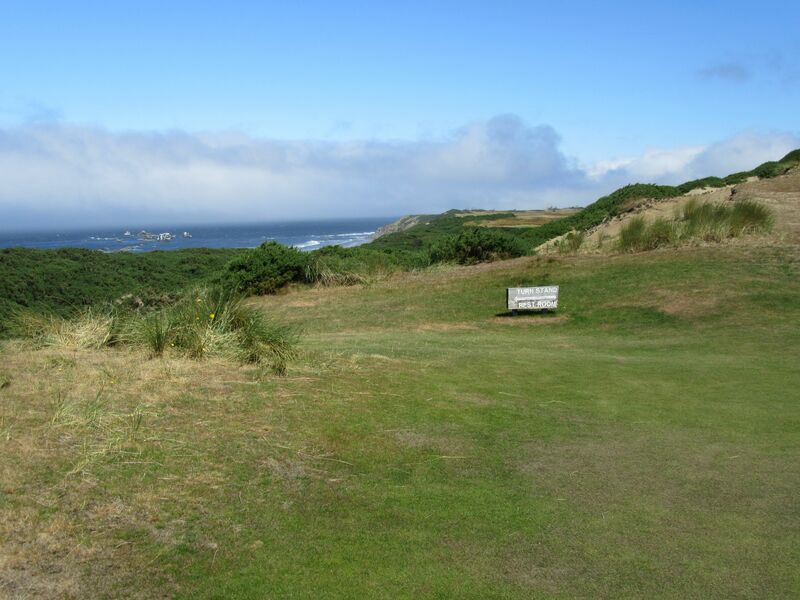 The land Old Macdonald was built on is more or less landlocked, with only a couple of true ocean vistas: The beautiful backdrops beyond the seventh and fifteenth holes. 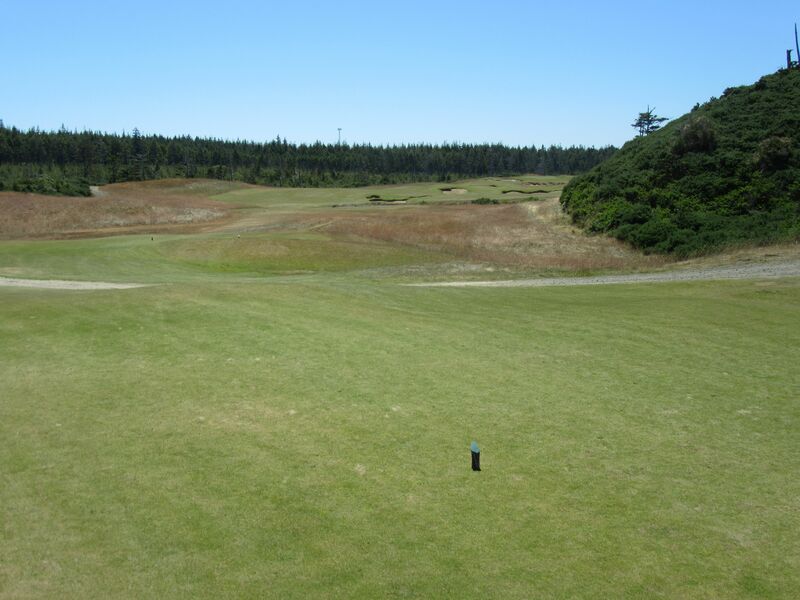 Contrary to Pacific Dunes’ and Bandon Dunes’ wealth of coastal holes, Old Macdonald’s inland layout still manages to exact the same “Big” feeling as the others – not just the sprawling fairways and sand blowouts, but the feeling of being in a vast natural area with no human developments in site (other than, of course, an unbelievably natural feeling links course!). 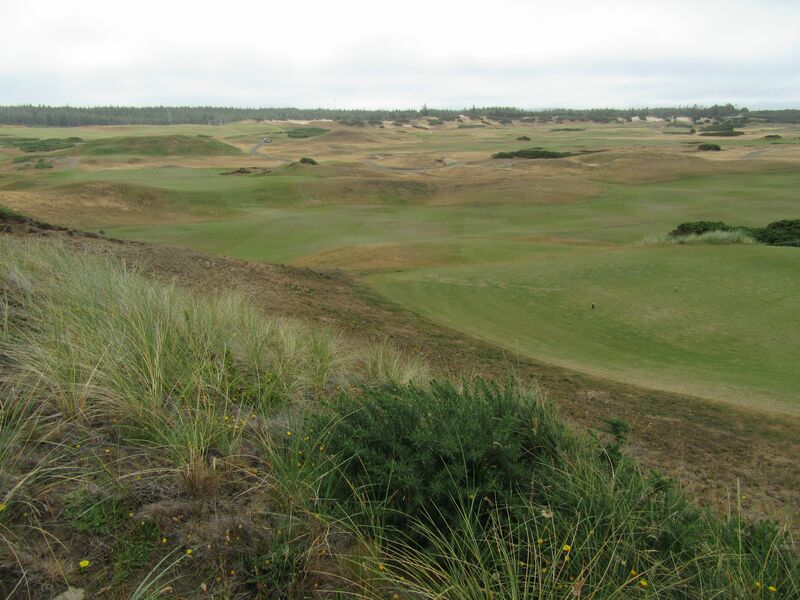 The tall sand dunes that shape the topography of Old Macdonald leave no view of clubhouses, parking lots, residential developments or anything of the like. 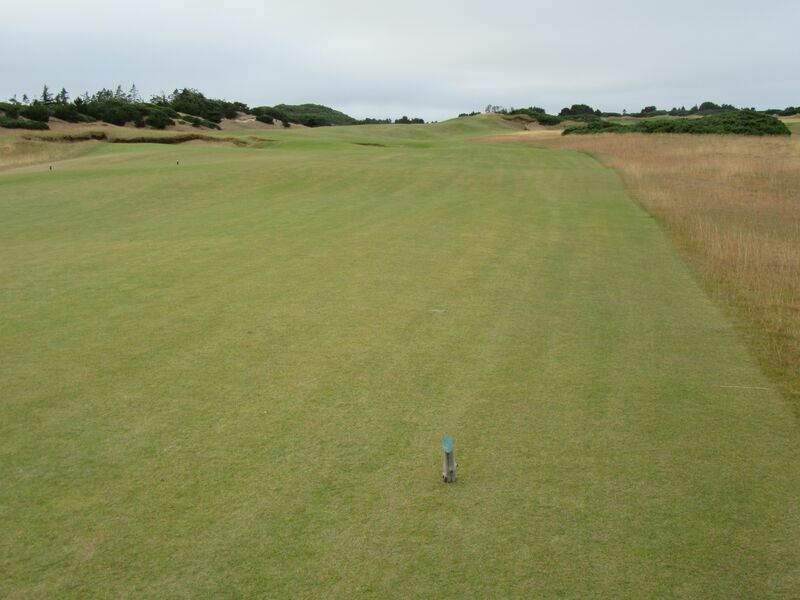 Not only are the fairways and sand features impressively sized, but even more so are the greens. 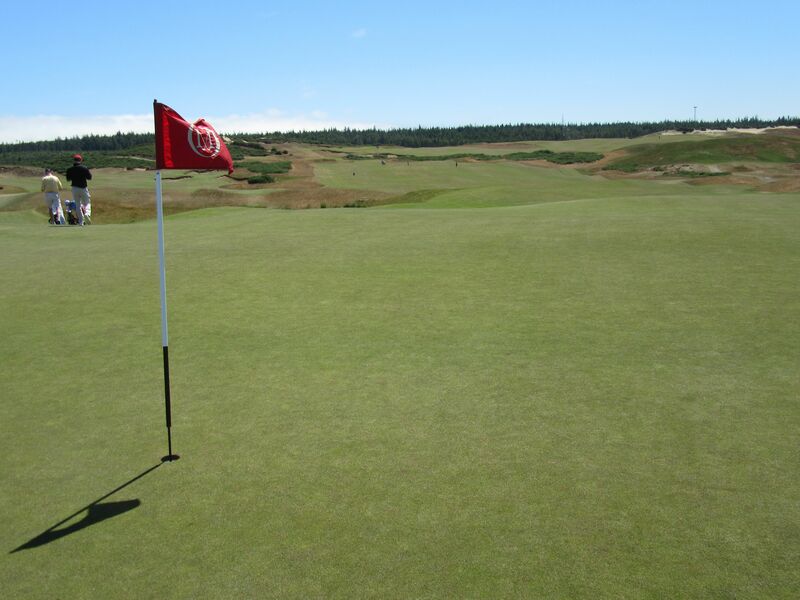 Old Macdonald boasts the largest greens in the world, averaging 14,600 square feet apiece. By comparison, this is three times larger than the average. 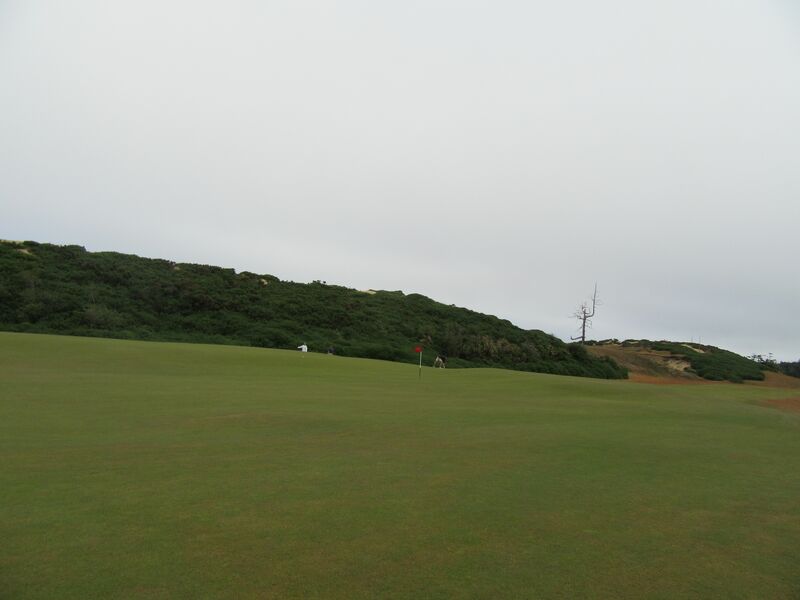 The large greens and fairways, coupled with rolling terrain that looks and feels natural, make for endless course setup options, and gives the impression that the course could never play similarly twice. 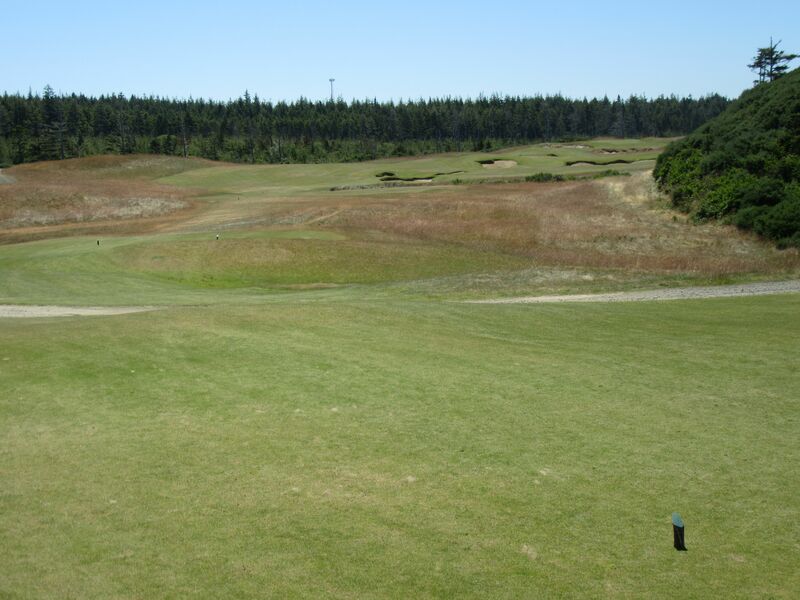 The golfing experience on Old Macdonald I am sure changes dramatically from day to day, especially with the intense sustained winds and gales that persistently blow over the property. We were paired up for our round on Old Macdonald with Rick and Andrew, father/son from Philadelphia who are members at Merion Golf Club. I typically enjoy mystery pairings like these, as I have had very few bad golf partners in the past. This one was no exception. The four of us had a lot of fun together, even though we all had our own stretches of difficulty with Old Macdonald. 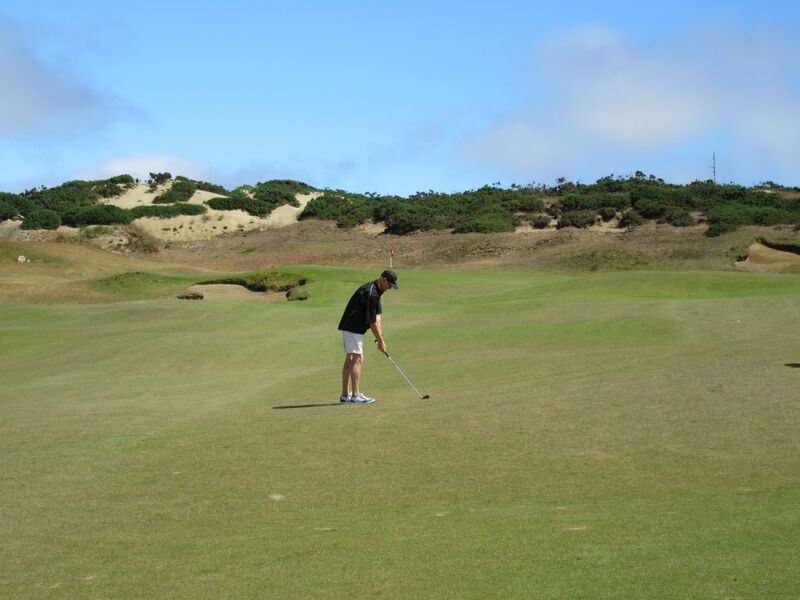 My stretches of difficulty came via the short game – any time I missed a green and was still on the fairway and needed to use a wedge, I might as well have picked up the ball and thrown it in the nearest and nastiest sand trap. 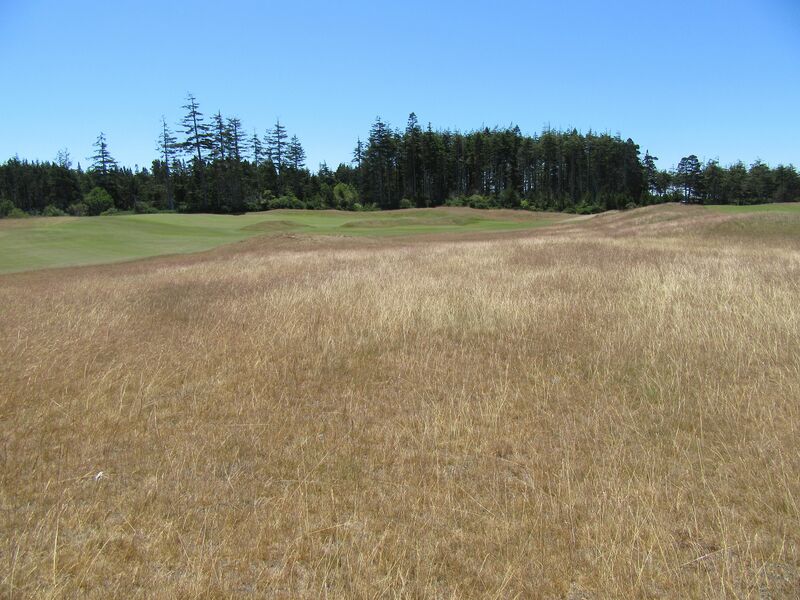 Uphill lies on this all fescue course are tight and underlined with sand, requiring wedge shots to be hit perfectly to avoid the club face shaving under the ball. 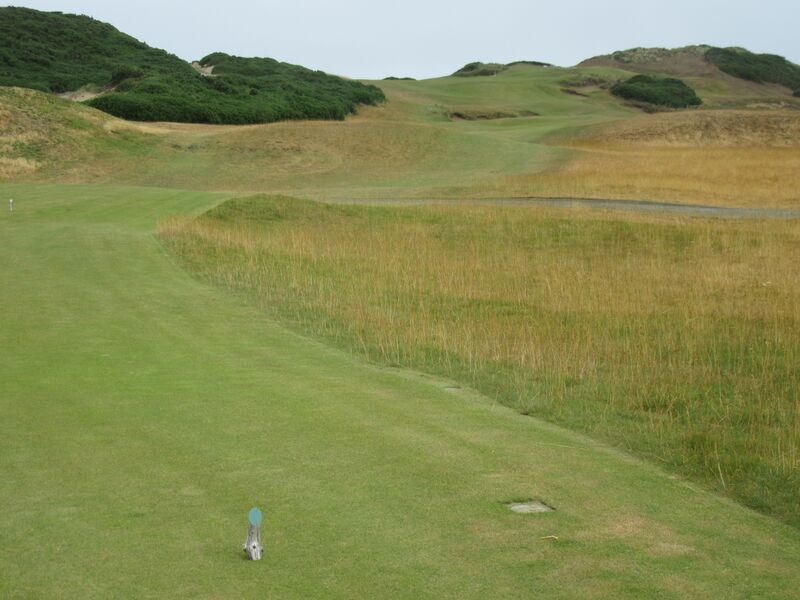 Old Macdonald begins with a short par four with a wide open fairway to help players get their game warmed up. 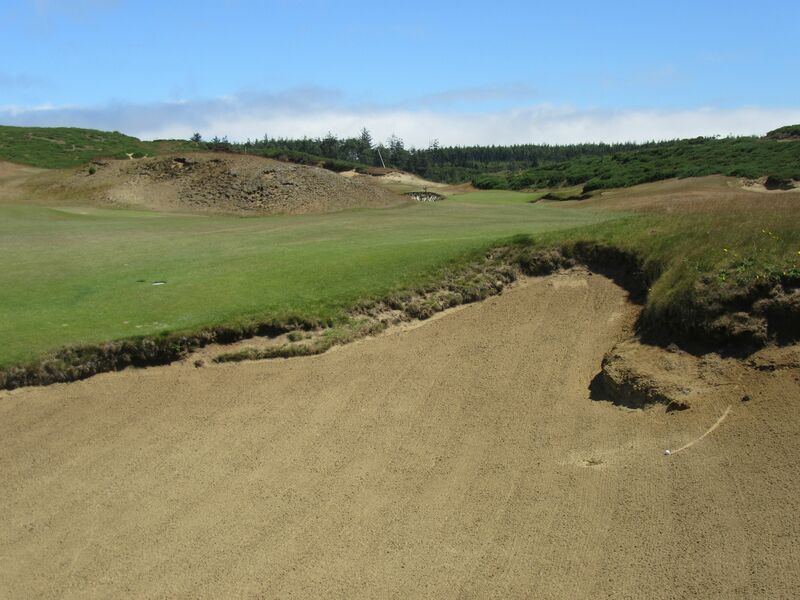 One craggy sand trap resides on the right side and needs to be avoided, but all of the trouble on this hole is found on the green complex – elevated and mounded to run anything on the sides off the putting surface. 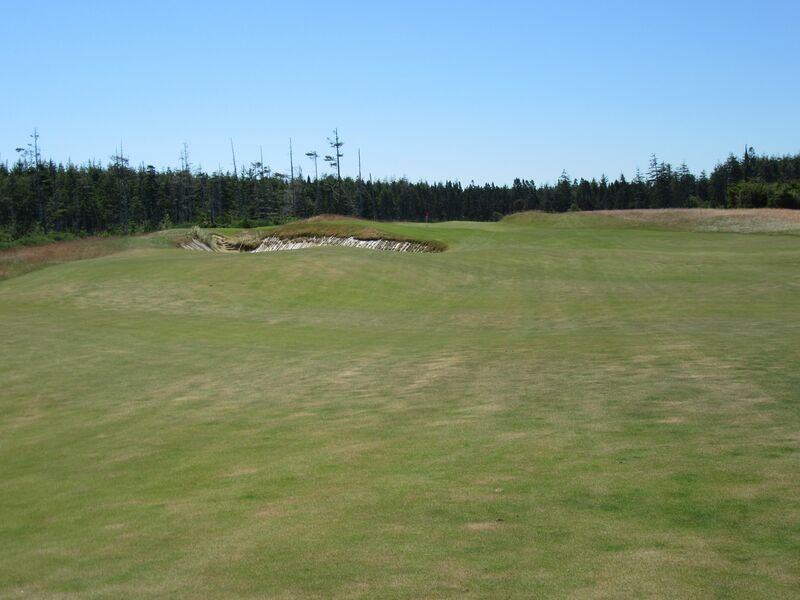 The first of the par threes on the golf course, the second at Old Macdonald is nicknamed “Eden” and has a steeply pitched green that runs from the back to the front to accept flown tee shots. 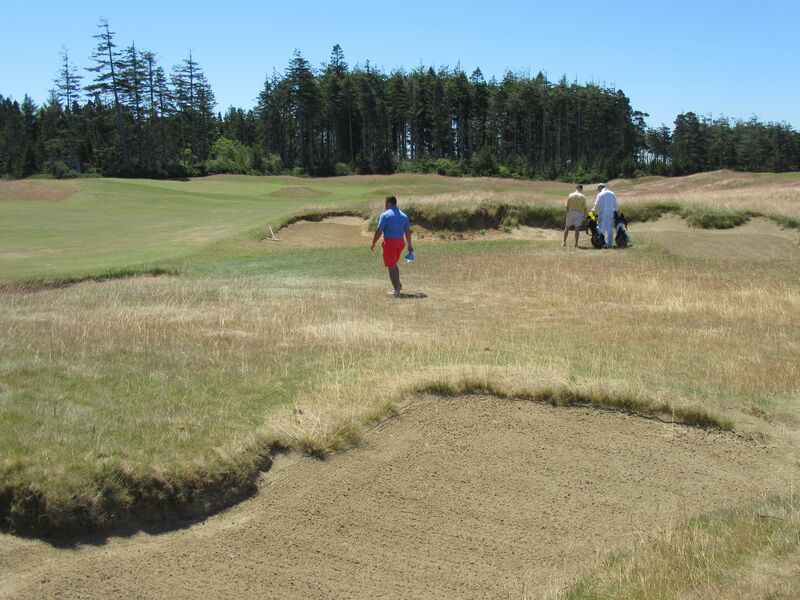 Avoid the trap left, but more importantly the deep bunker on the right side, similar to the Strath bunker on the Old Course at St. Andrews. 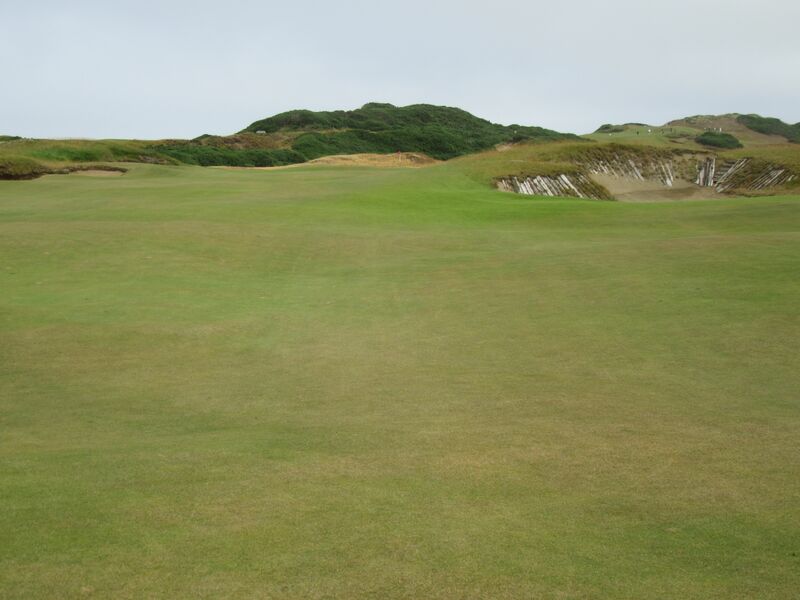 The green on Eden is quite wide, but fairly short from front to back with a drastic false front. 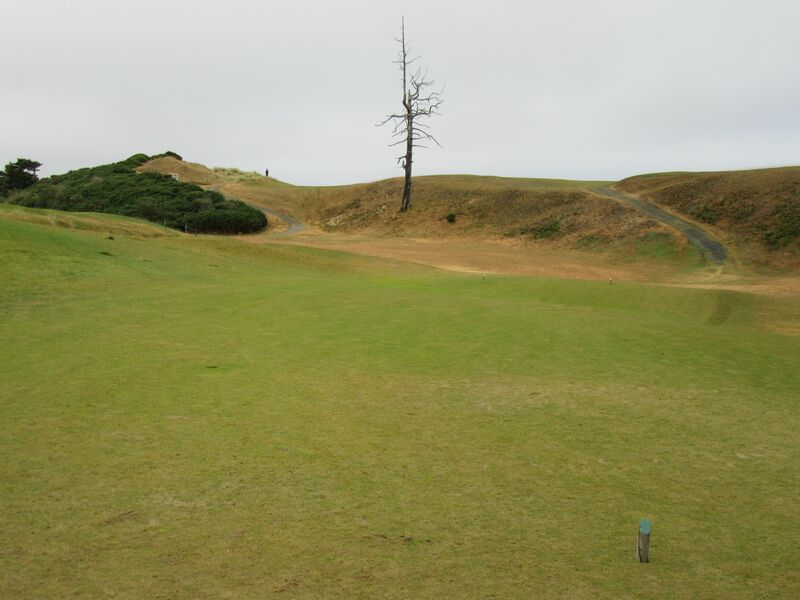 With a blind tee shot, the par four third hole at Old Macdonald is best played just right of the ghost tree. 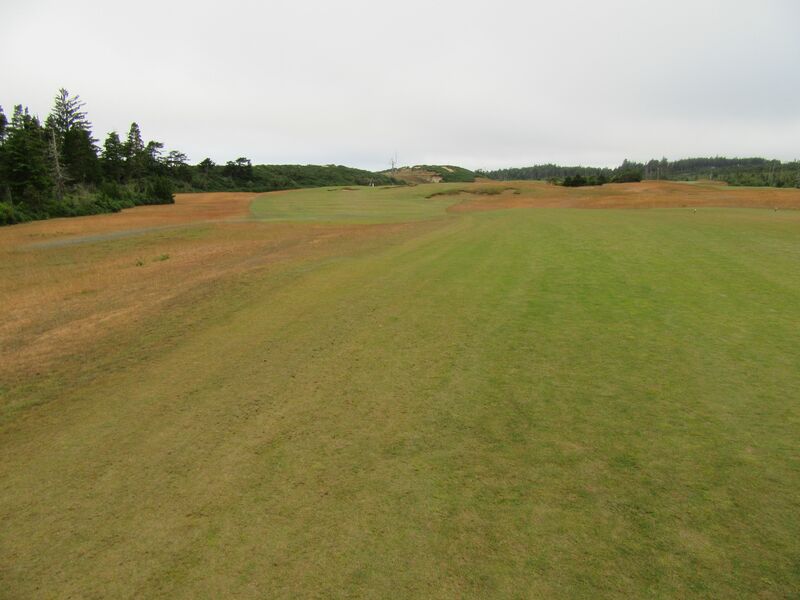 The fairway is wide and forgiving, and beyond the massive sandy mound plays downhill and to the left to a huge green complex. 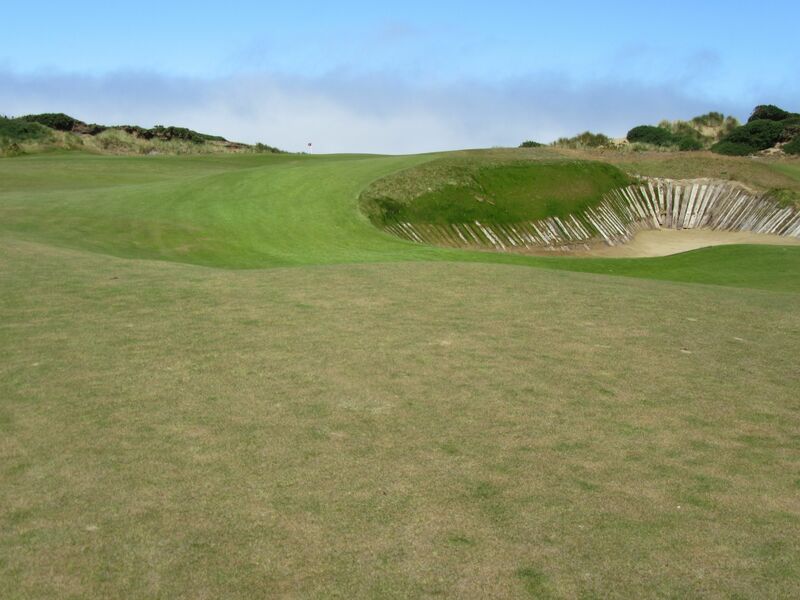 “Sahara” was designed with the fourth hole of the same name at Royal St. Georges in mind, and is one of the most iconic holes on the entire course at Old Macdonald. 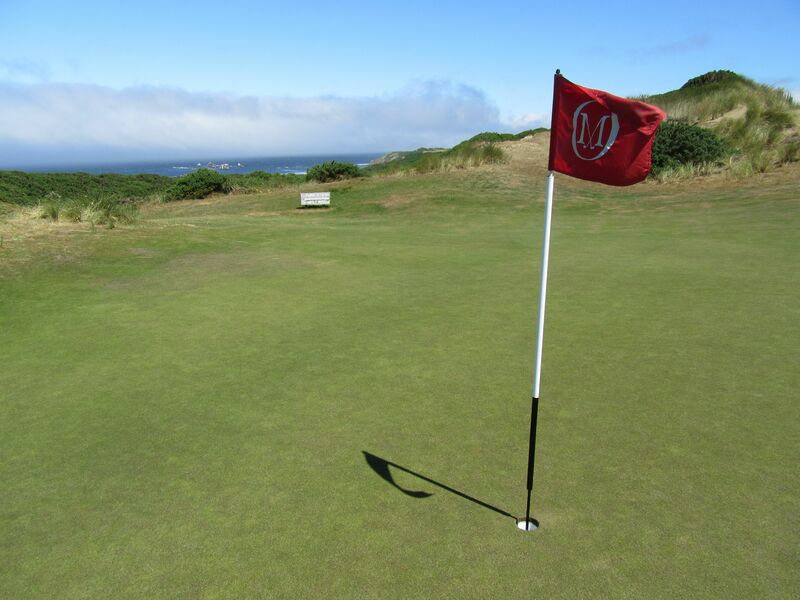 Sixty-foot putts are not just rare, but expected on the greens at Old Macdonald. 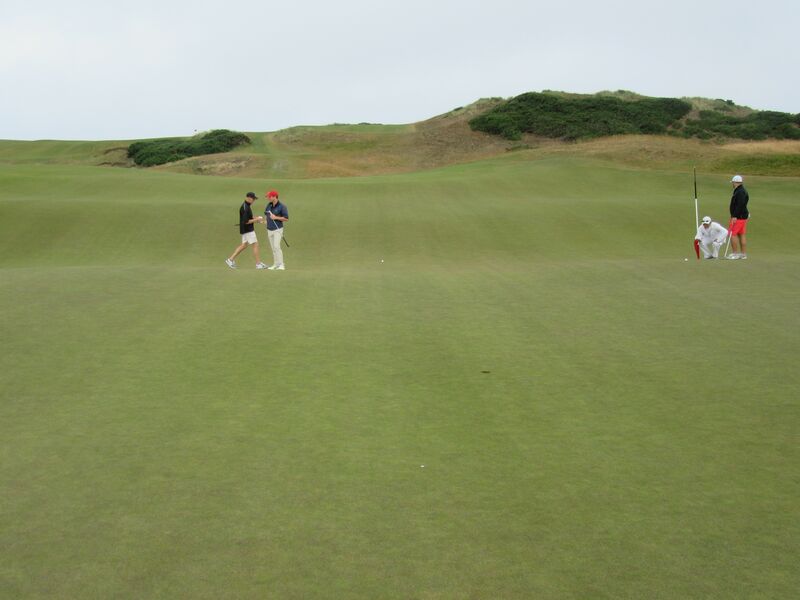 The green on three is nearly 20,000 square feet! 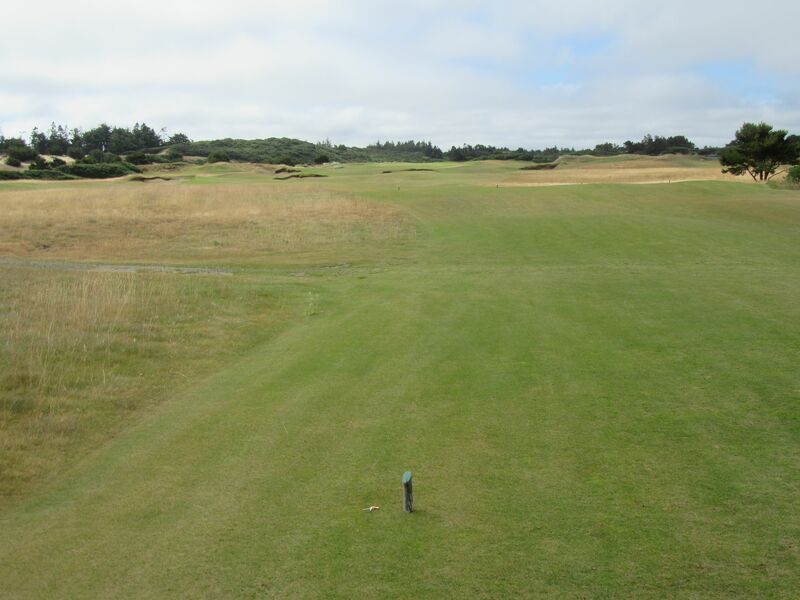 A tremendously long par four, the fourth plays from 472 yards from the first tees in, and 504 from the tips! 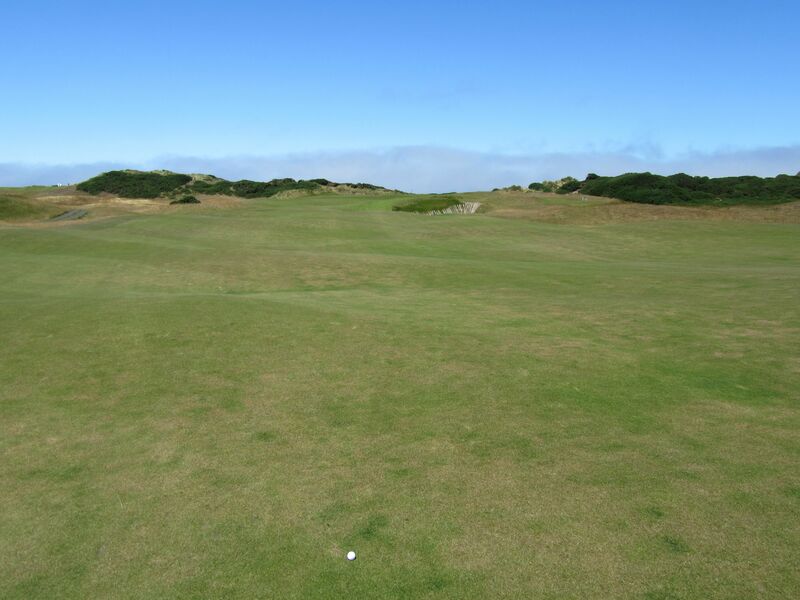 The fairway off the tee is not too difficult to hit, but the second shot has to be absolutely precise, and long! 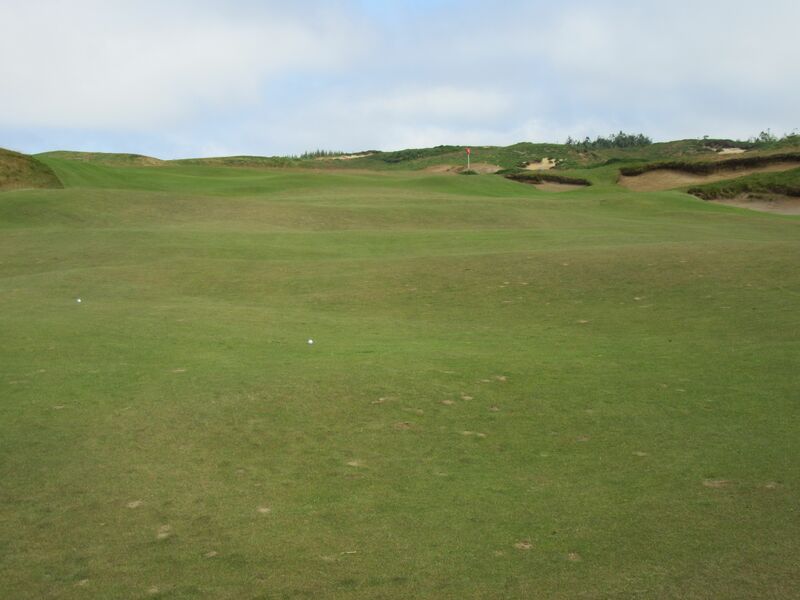 If lying up on four the ball has to be played to the left part of the fairway to avoid the deep side trap that is shown in the third picture, below. Anything finding this trap is almost best played out sideways with its massive front lip. 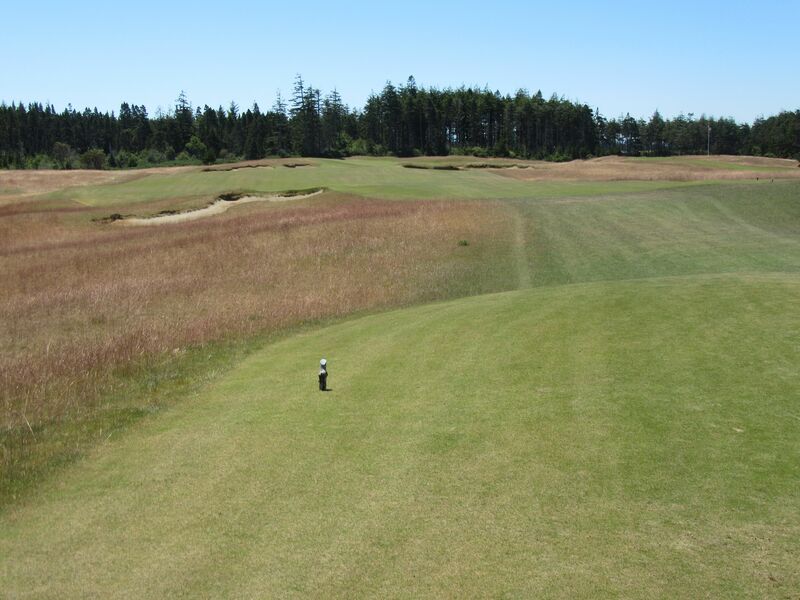 Nicknamed “Short,” the par three fifth hole is short, indeed. 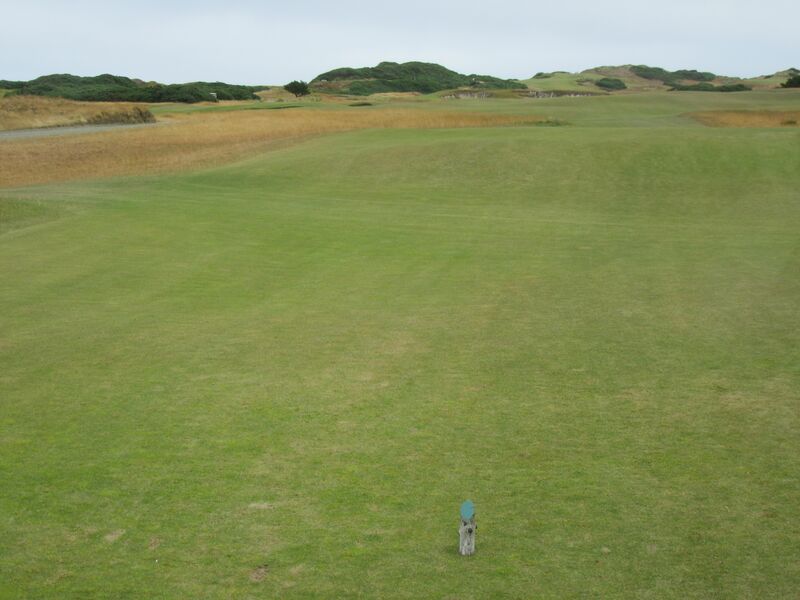 It is not the distance that creates challenge on five, but the putting surface and its myriad of ridges, breaks and contours. 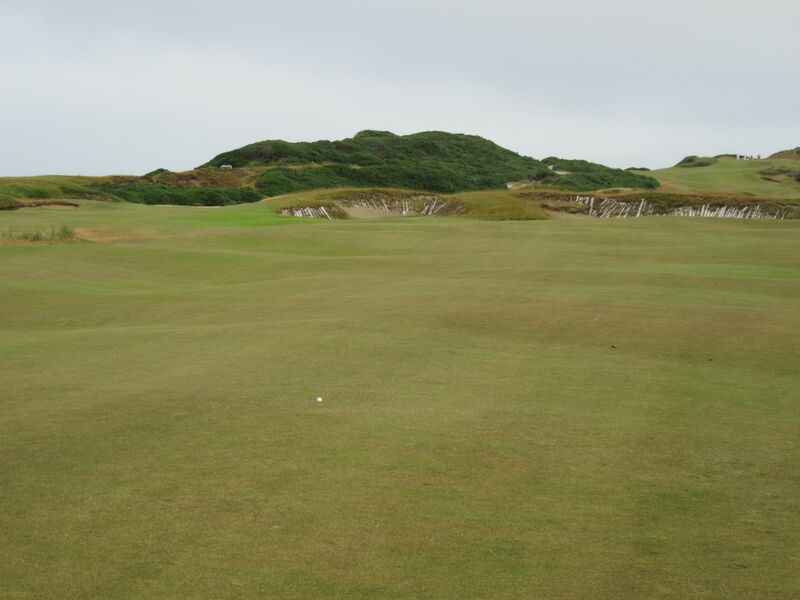 The green on five is gigantic, and its primary slope is from back to front, so proximity to the hole is key to avoid potential three-putt situations. 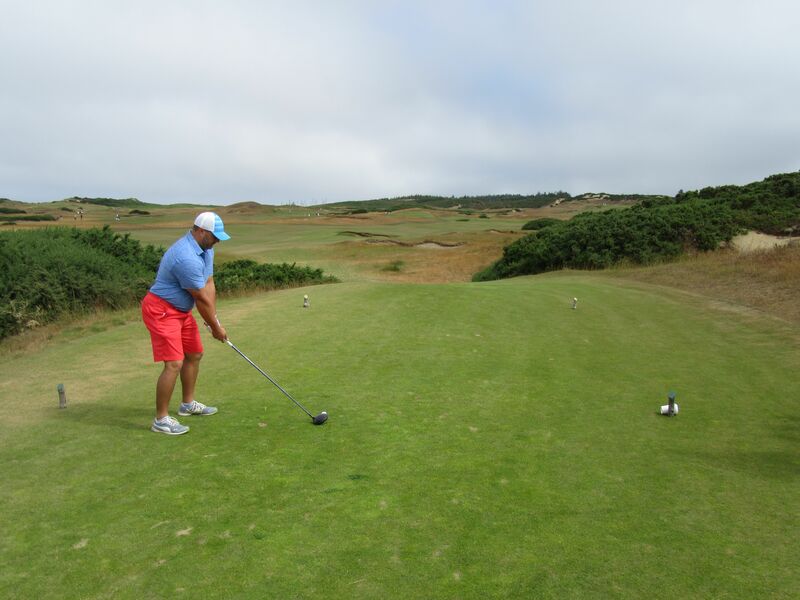 Both Greg and I were within ten feet of the pin off the tee – the hole was playing short and the hole location ran hard right to left. Both shots looked like they had a chance of being much tighter. 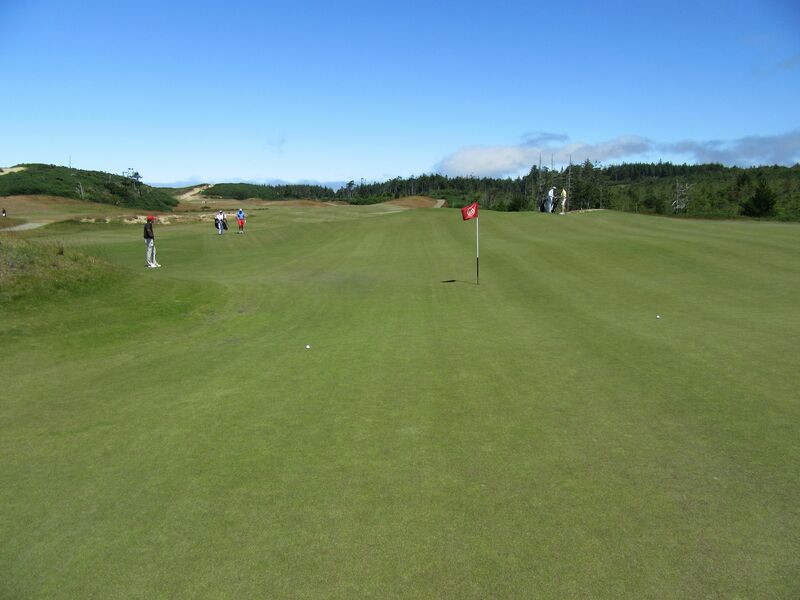 The sixth is a long par five, and plays dead in to the wind. 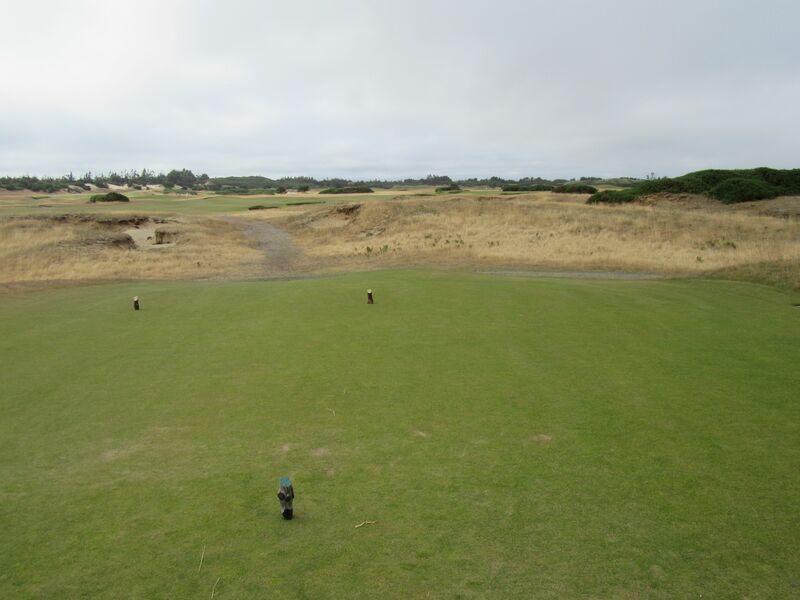 Playing straight out off the tee, the fairway leans left before correcting itself again to the right and toward an elevated green complex with a number of ridges creating individual sections that both make this green challenging to hit in the right spot, and also to hold on the approach. 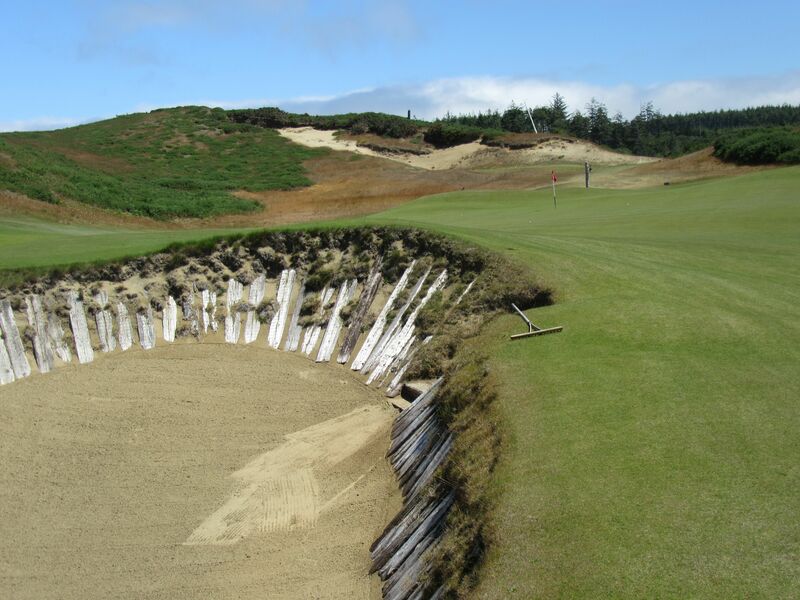 The trap I found on my second shot wasn’t quite Hell’s Bunker, but was far from friendly! 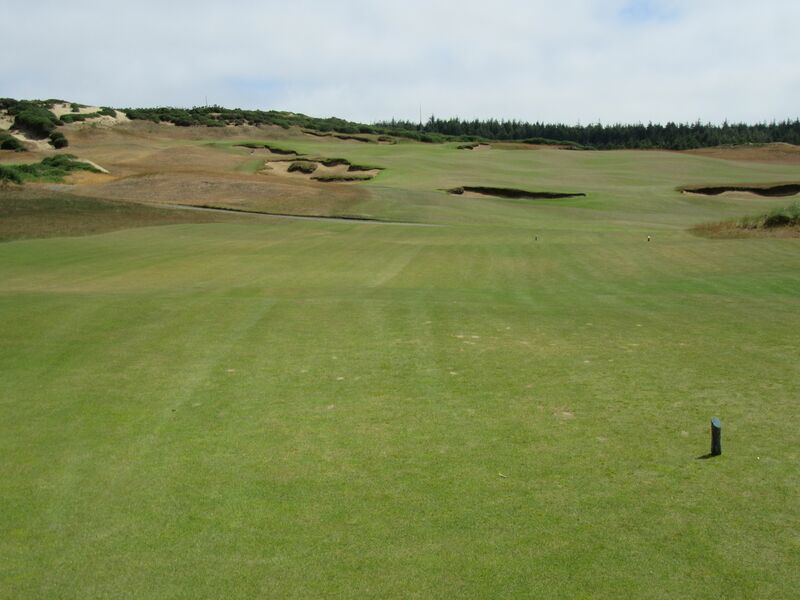 Seven is an amazing, mid-length par four. How can 363 yards from the tips be mid-length, you ask? Because it plays almost directly uphill. 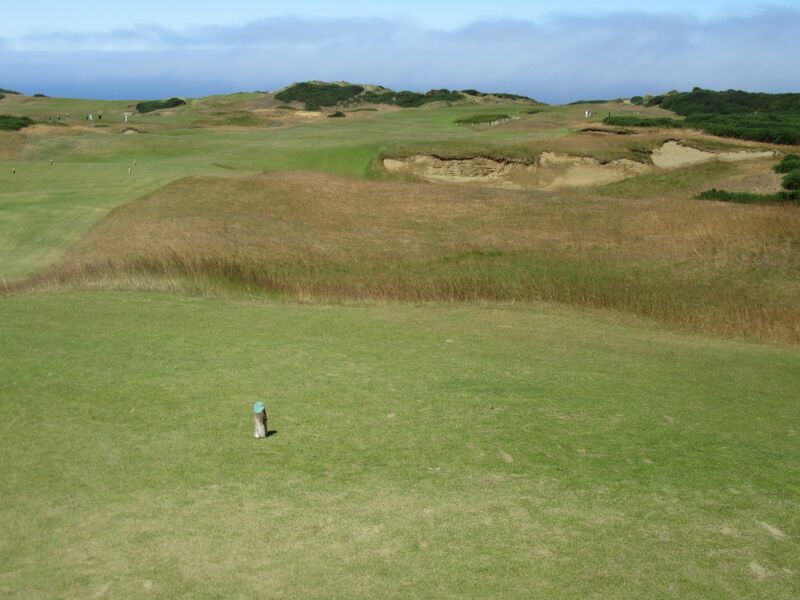 The front of the green falls off sharply toward the front-right sand traps, and this beautiful green is abutted by the course’s first, mesmerizing view of the Pacific Ocean. 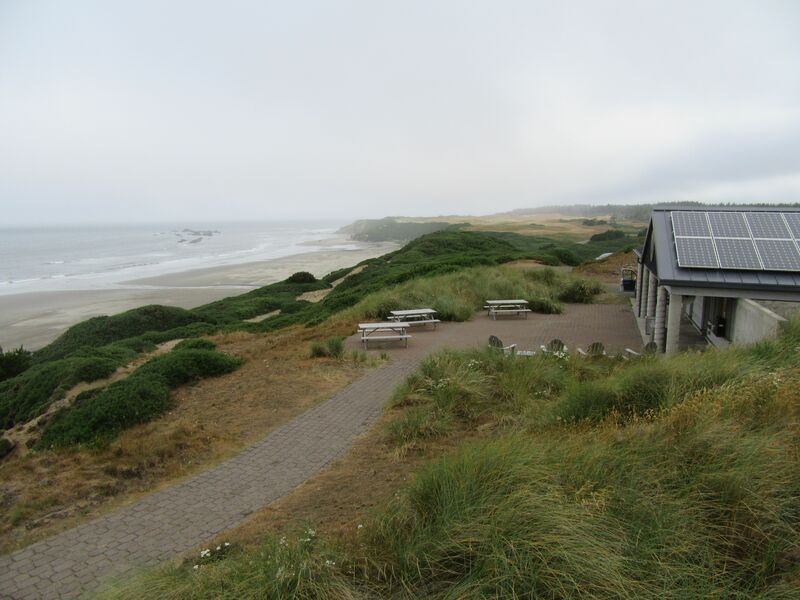 Eight features the classic “Biarritz” green – 20,000 square feet of it! – in a downhill adventure that unfolds before the players’ eyes. 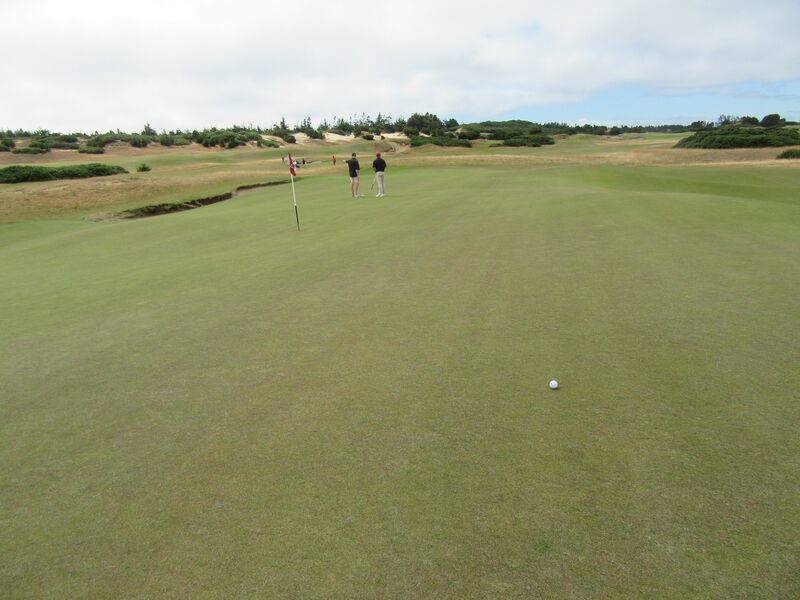 The trough running laterally through the middle of the green is about three feet deep, so taking note of the hole location is principal when teeing off. 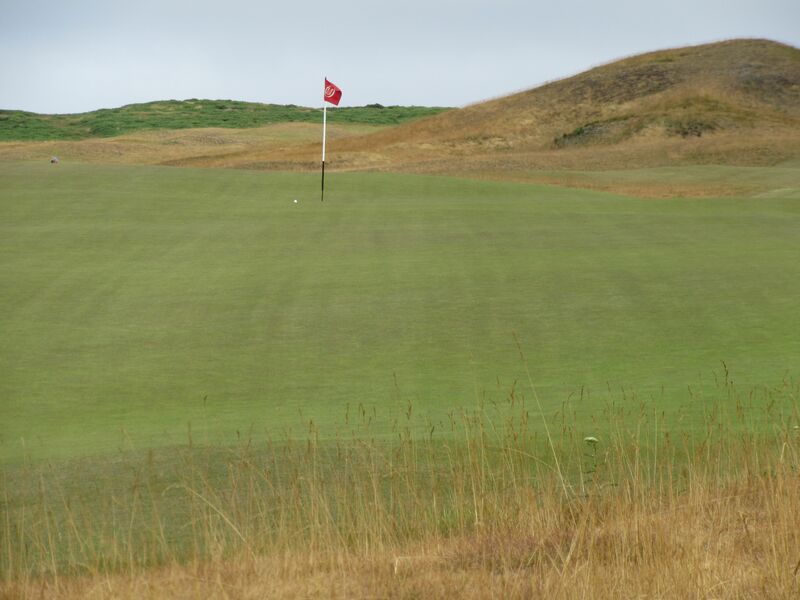 Our back pin location meant all systems go, and boy was it fun watching my tee shot fly downhill, disappear on the front of the green, reappear in the swale then roll up the other side and right… Right past the flag. An ace on this amazing golf hole would have been as good as it gets for my first hole-in-one, but it was not to be had on this day. 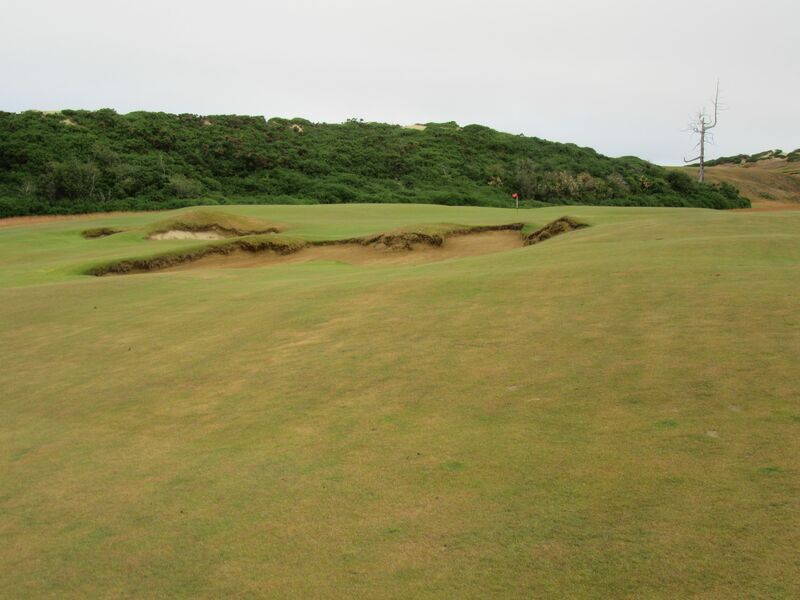 Nicknamed “Cape,” the ninth hole is a long par four with sand traps littering the right corner of the dogleg right. 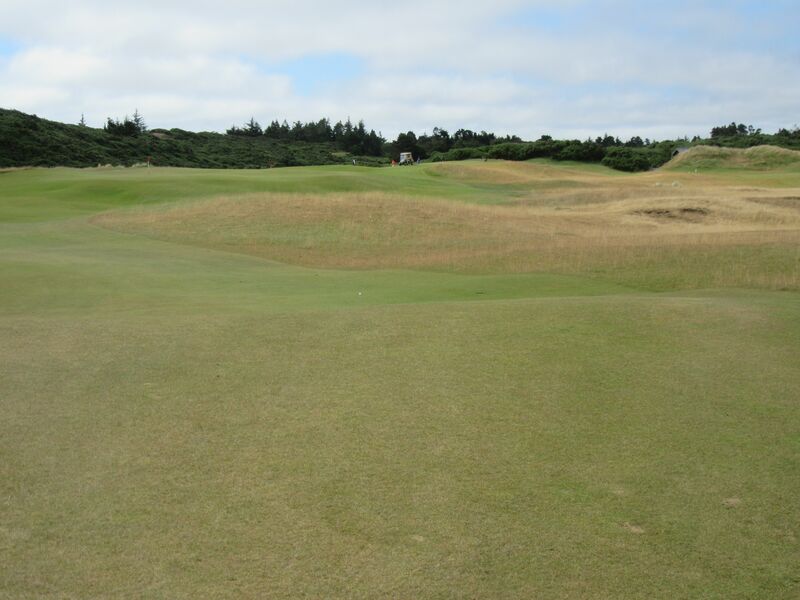 The safe play is from the left side of the fairway, but will make the hole much longer if done. Another elevated green awaits to finish the front nine. 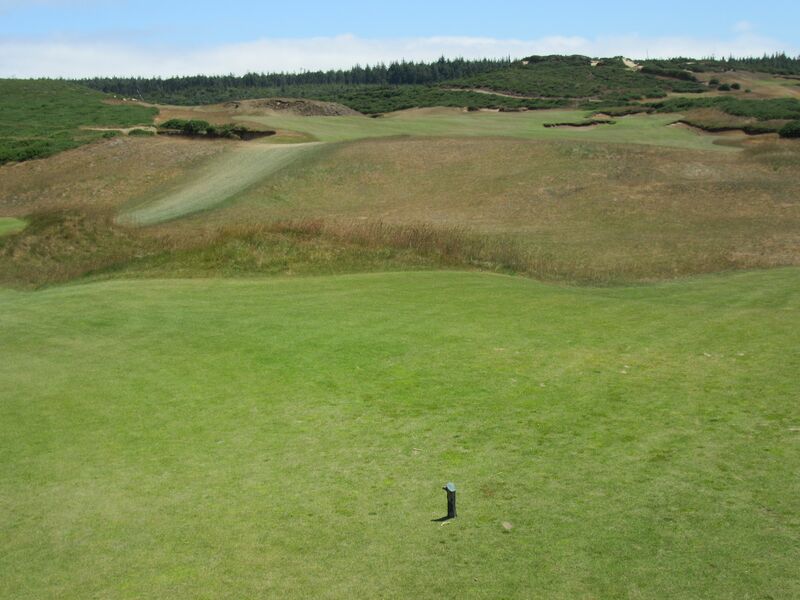 The back nine begins with a long, straightaway par four deemed “Bottle.” The traps toward the middle of the fairway on each side make club selection off the tee important – anything hitting these almost assuredly minimizes the chance for par, while anything avoiding them will keep four in play. 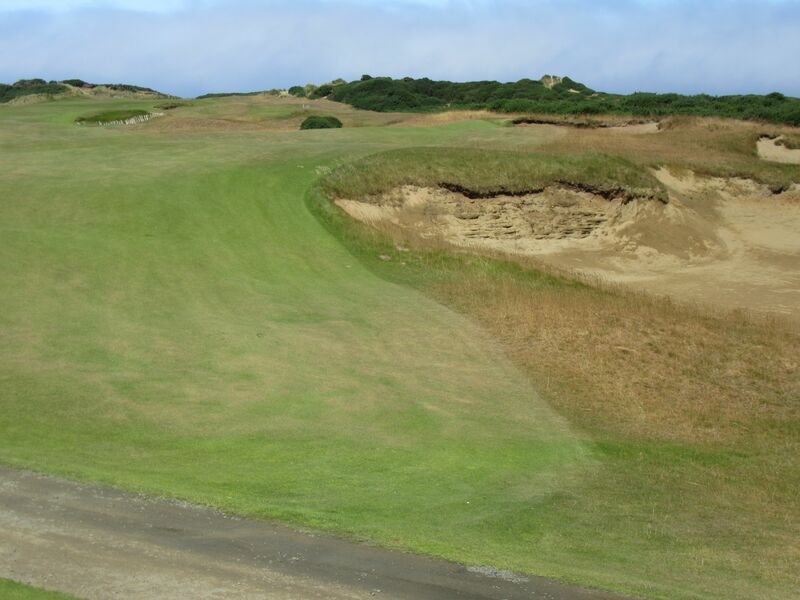 An homage to St. Andrews’ famous “Road Hole,” the eleventh at Old Macdonald’s fairway runs horizontally to the tee box toward the right, and finishes with a raised green with one of the most vicious pot bunkers I have seen on the front-left side. 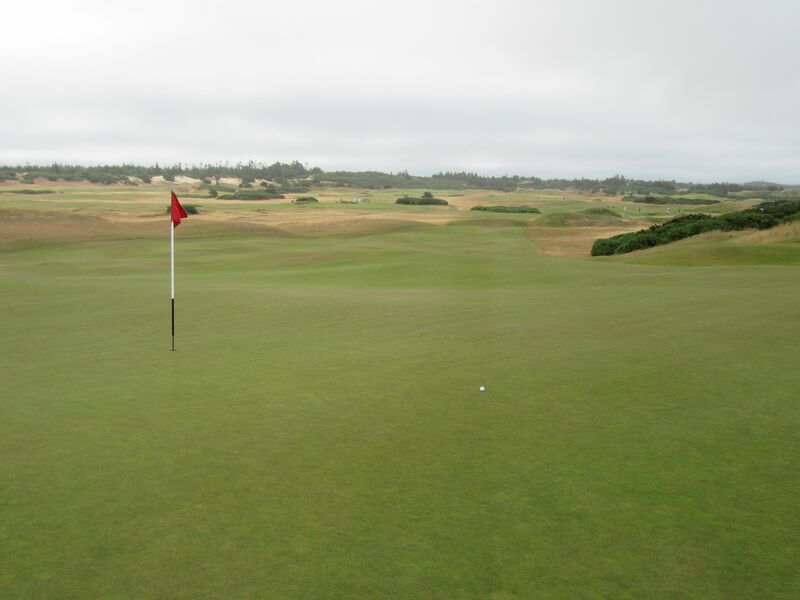 I snap-hooked my tee shot on the eleventh, drawing hard toward the twelfth hole green, up the false left side and toward the pin. “Get in the hole!” Mitch (caddying for the other twosome in our group) shouted. 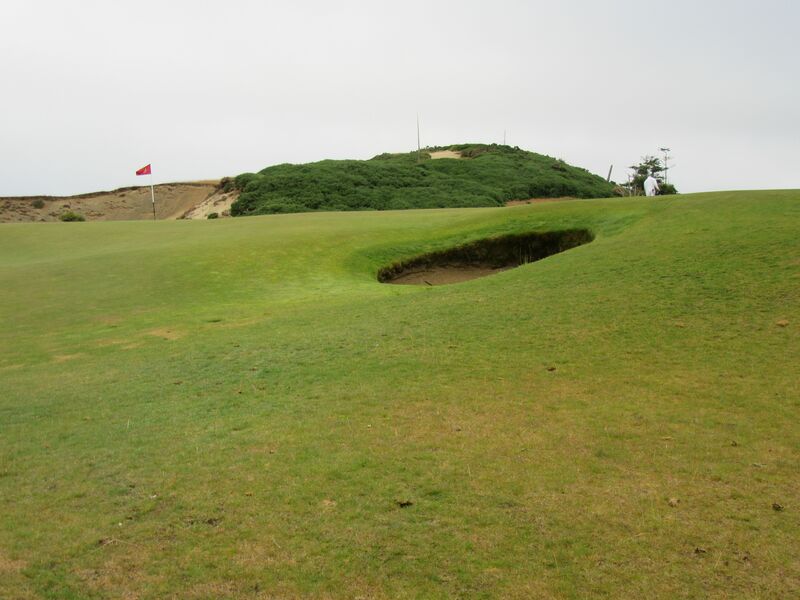 It rolled to about six feet from the pin – nobody got anywhere near that close off the tee on the par three twelfth, but it was not the best timing to get close to the hole on the “Redan” par three. 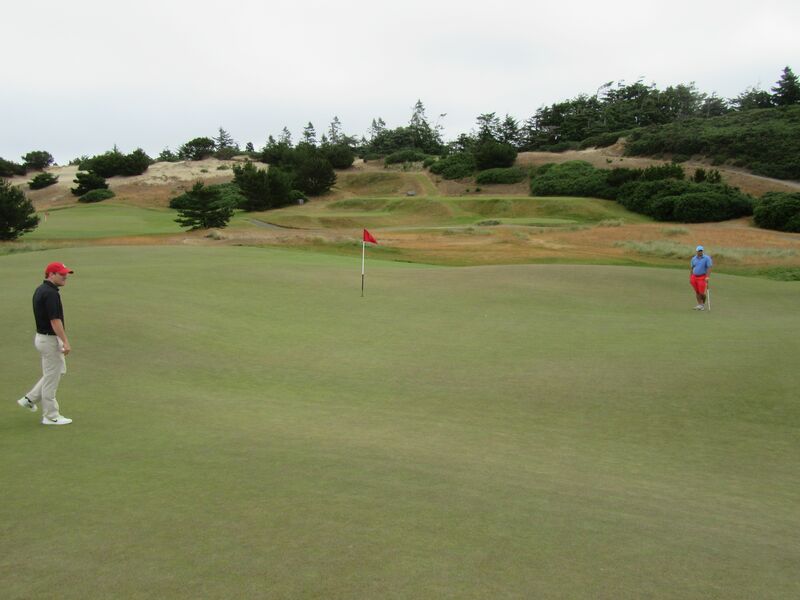 Daniel had me drop off of the green, of course, and I took a circuitous route around the left side of the green and somehow managed to avoid sand and get on in three. 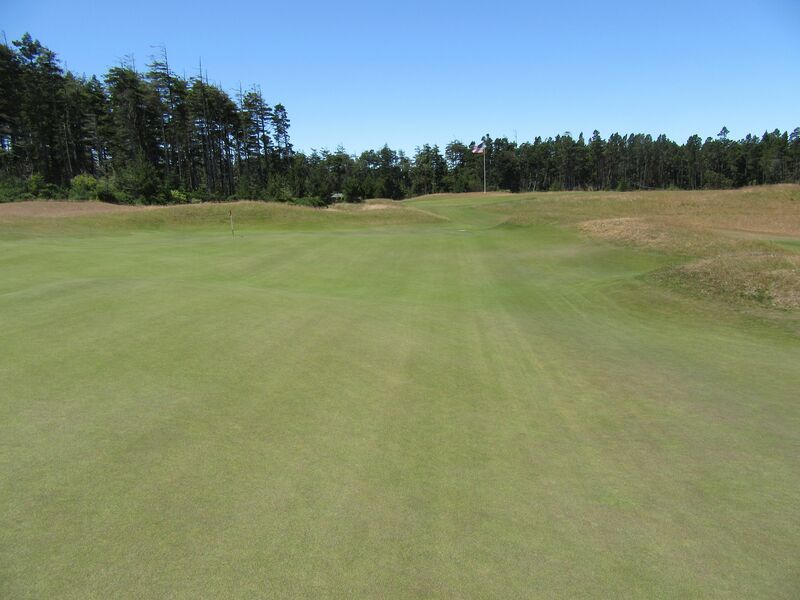 Maybe the toughest green on the entire course, the “Redan” putting complex on the twelfth hole drops off on all sides, and features a huge laterally running ridge across the middle. 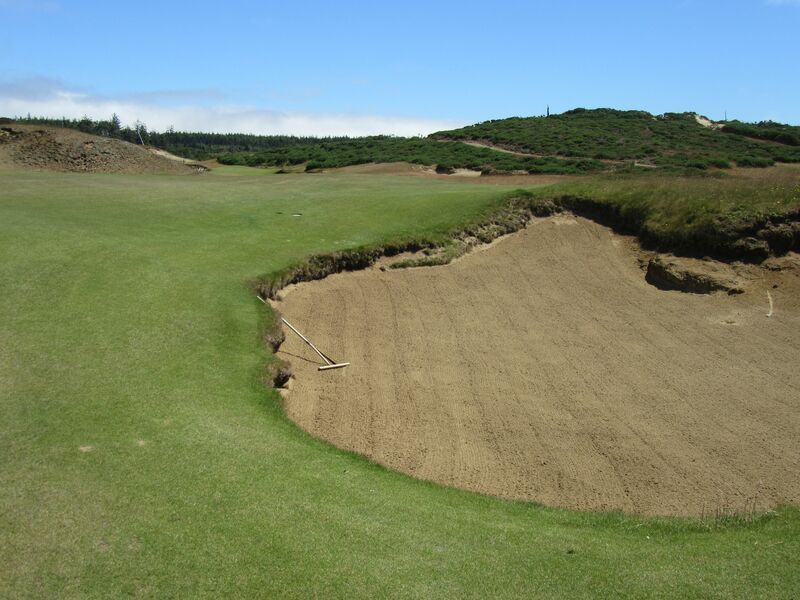 The sand traps in front of the tee boxes help hide the false front, and some of the green’s contours. 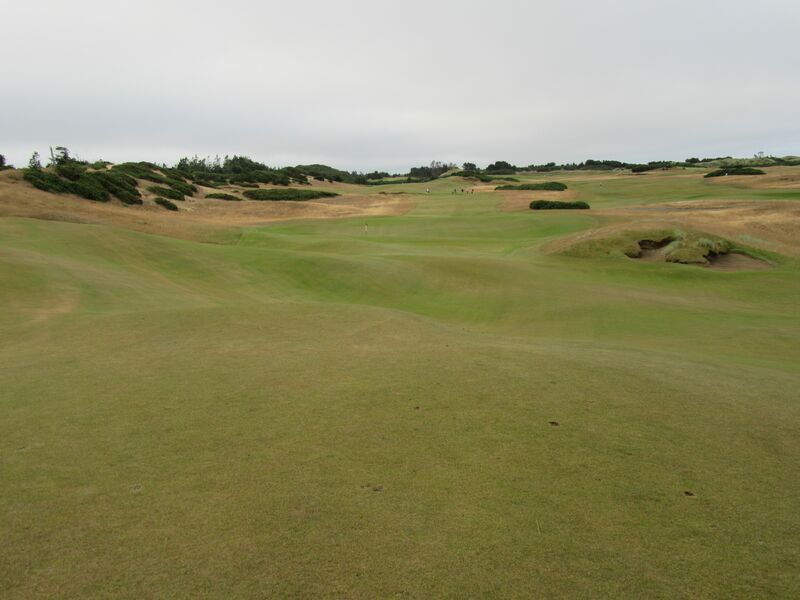 This Redan hole is modeled after the 15th at North Berwick. 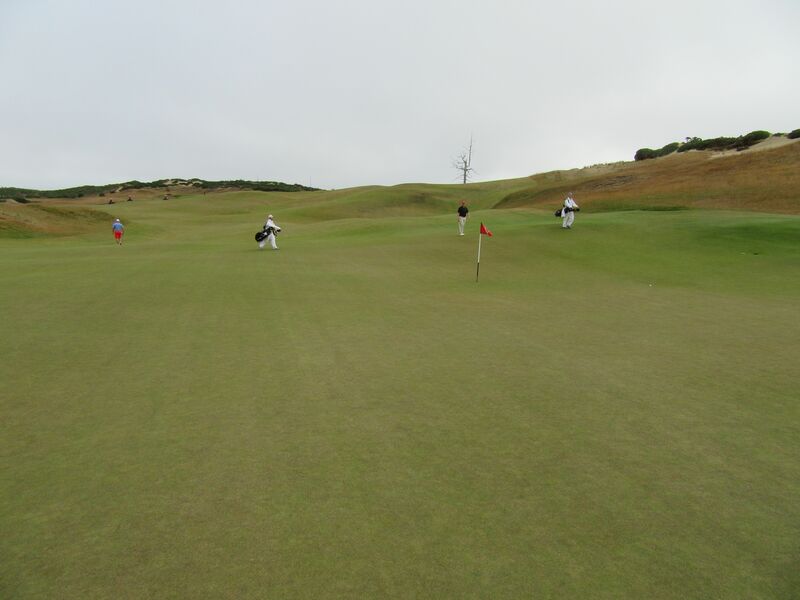 As you can imagine, this putt was quite slippery from right to left! 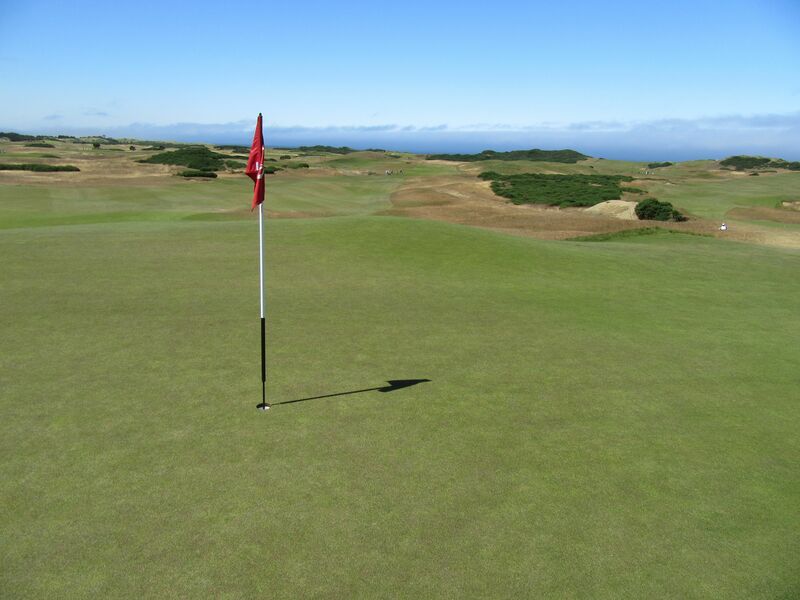 With one of the wildest greens on a course renowned for its wild greens, the fairway on thirteen doglegs softly toward the left and finishes between two sand dunes. 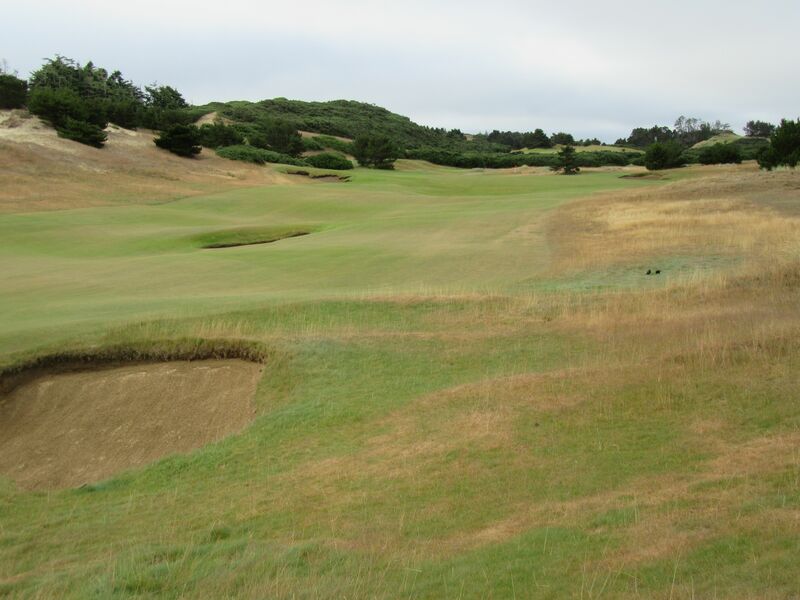 For days I had admired the layout and green complex of the fourteenth hole from the back nine on Pacific Dunes. It was finally time to play the unique challenge that is the par four fourteenth. 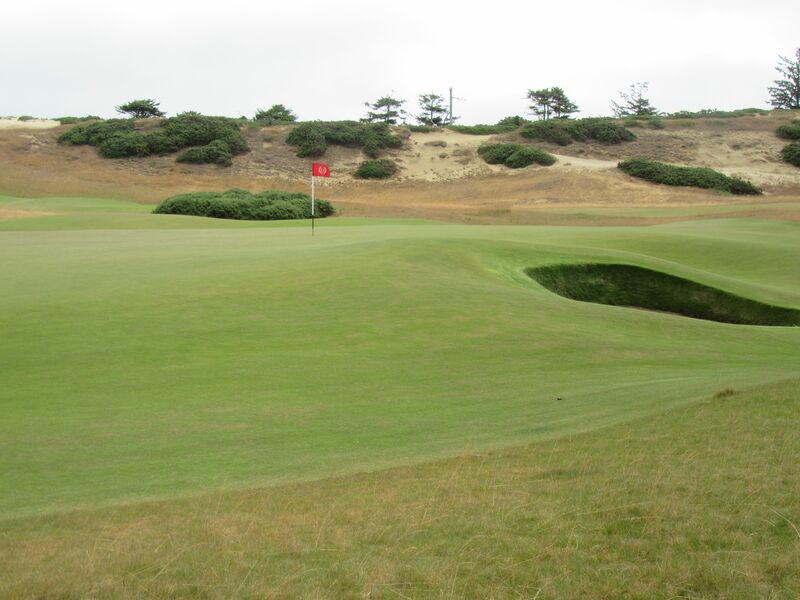 With one of the widest fairway areas on the entire course, the tee shot on fourteen is relatively stress-free as long as it avoids the fairway bunkers. 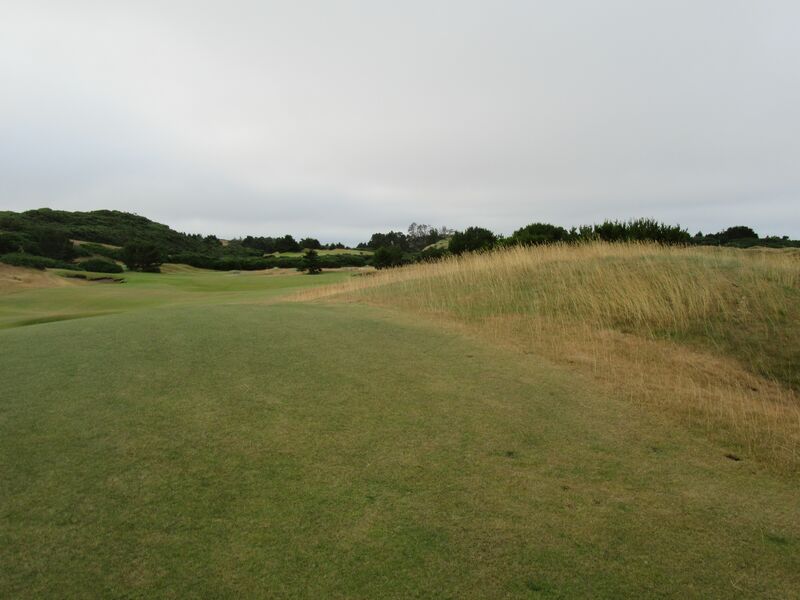 What comes next, though, from the fairway, is one of the most challenging approach areas in all of golf. 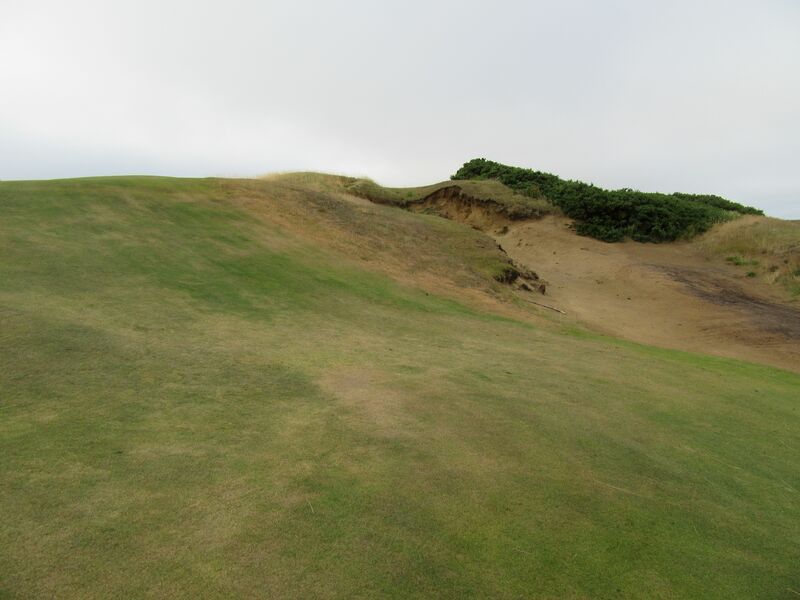 Straight up hill, a massive false front leads to an extremely difficult bunker. 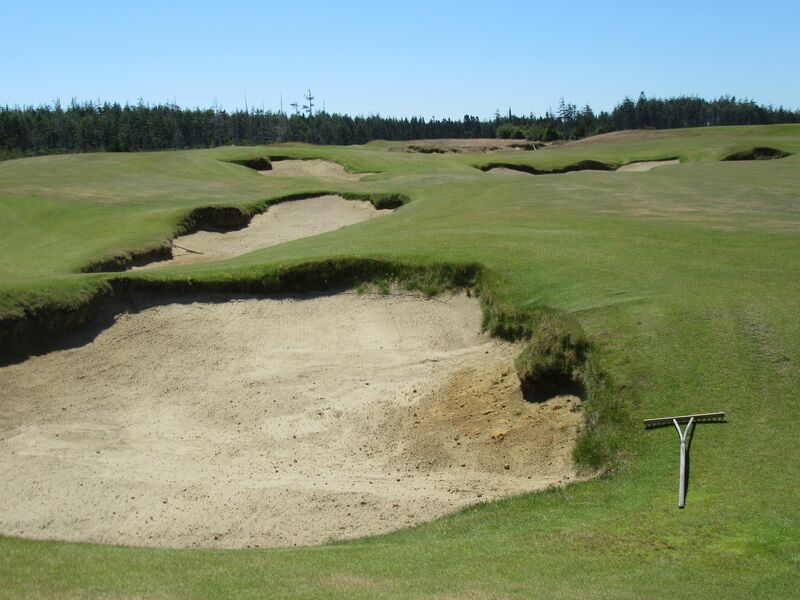 It is important to note, by the way, that I would not recommend trying to lay up to many of the green complexes at Old Macdonald, and certainly not to this one. 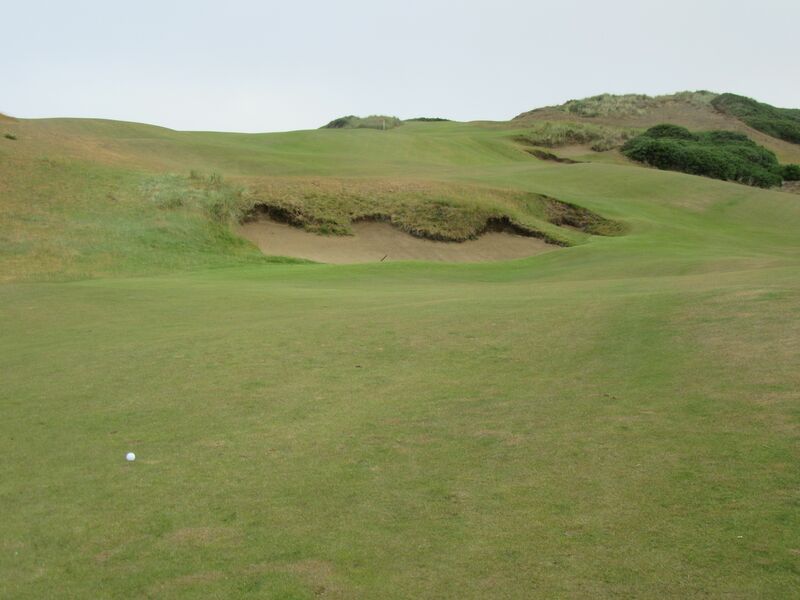 Fly the green, if you can, or find yourself hitting wedge off the tight, sand-laden lies that have to be connected on perfectly. My second shot here managed to stay out of the sand, but with fifteen yards in my wedge [once again] slid under the ball and left it on the false front, then falling off to yet another hellish bunker shot. 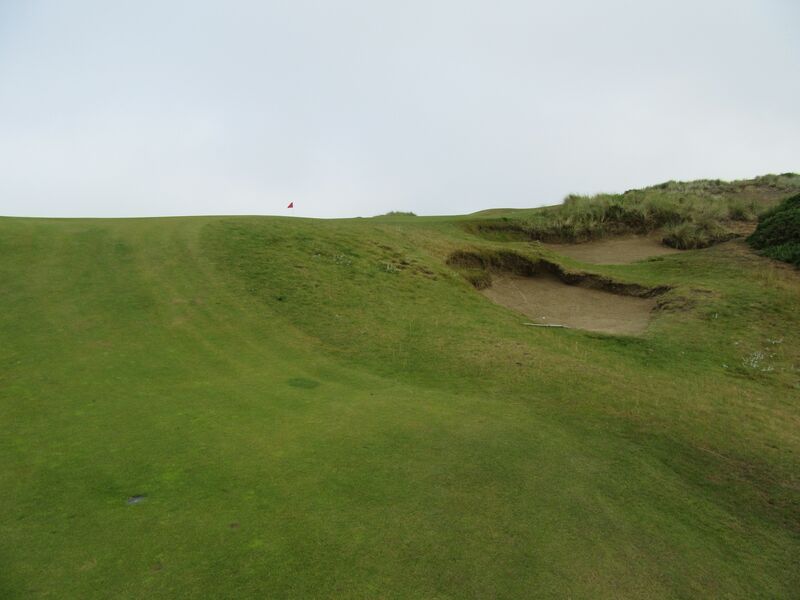 The par fifteenth on Old Macdonald is a beast! 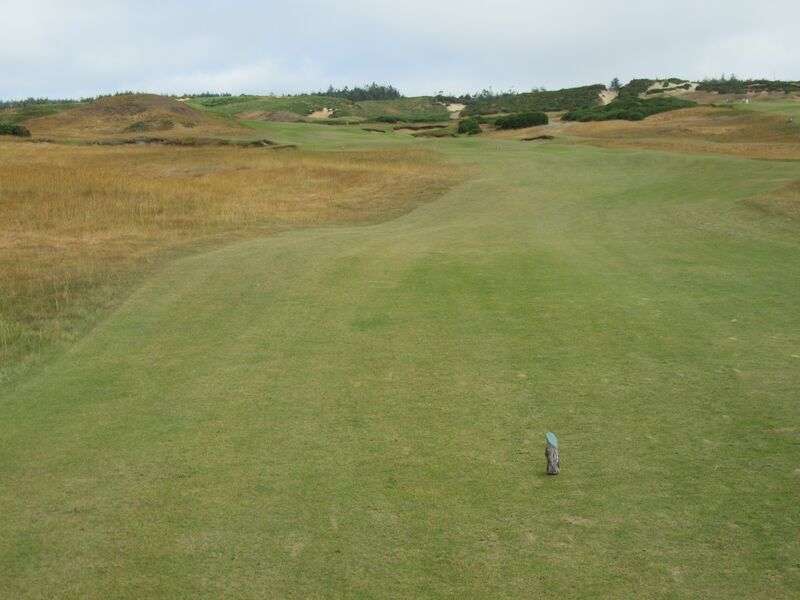 In Doak fashion, the tee shot is relatively stress-free to a wide open fairway that will roll out quickly or take any number of contours to its final destination, but the second shot and approach are absolutely fraught with danger. My 300-plus yard tee shot left me with a big choice: Hit long and risk a high number, or lay up in front of the railroaded central bunker? 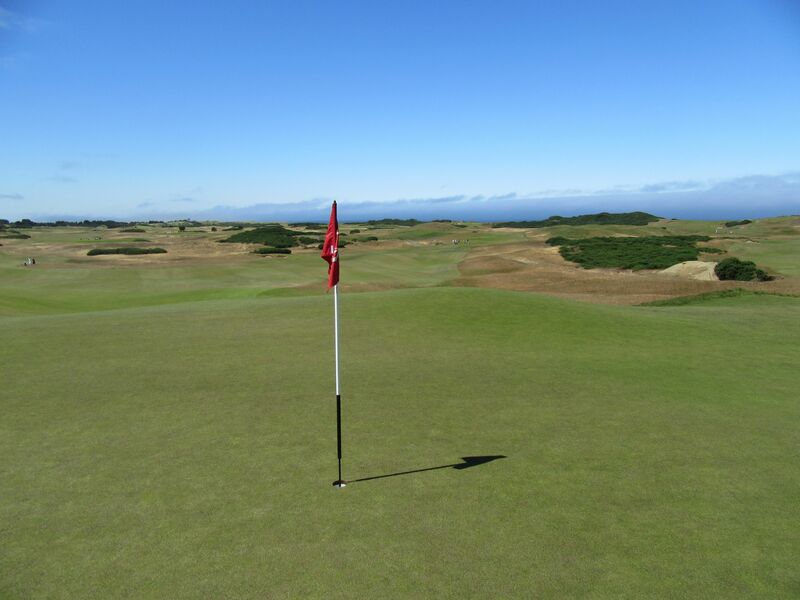 Nicknamed “Alps” after the seventeenth at Prestwick, the sixteenth at Old Maccdonald is an extraordinarily fun, demanding par four. 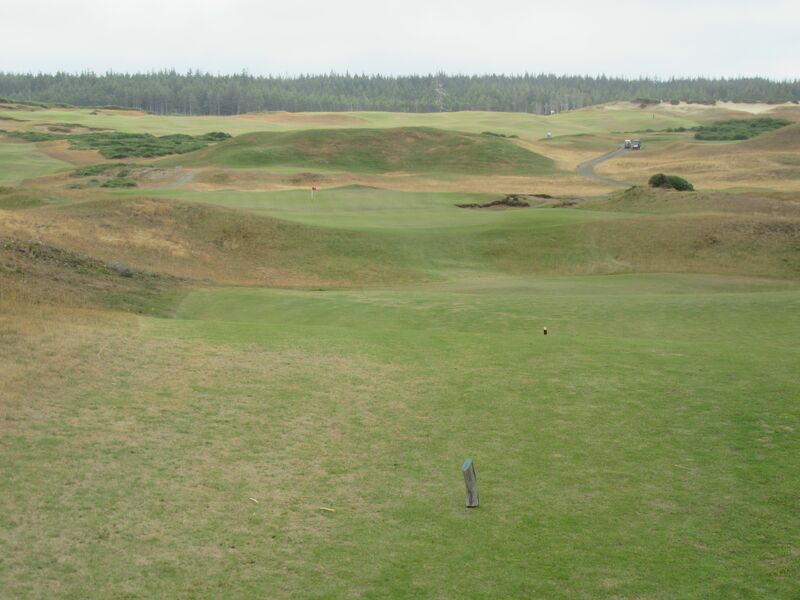 Playing for the first time, it may be confusing where to go, but the green is accessible several different ways: Down the right side of the fairway and then a long approach left, or a tee shot short of the tall mound on the left and then a shorter, blind shot over the hill. 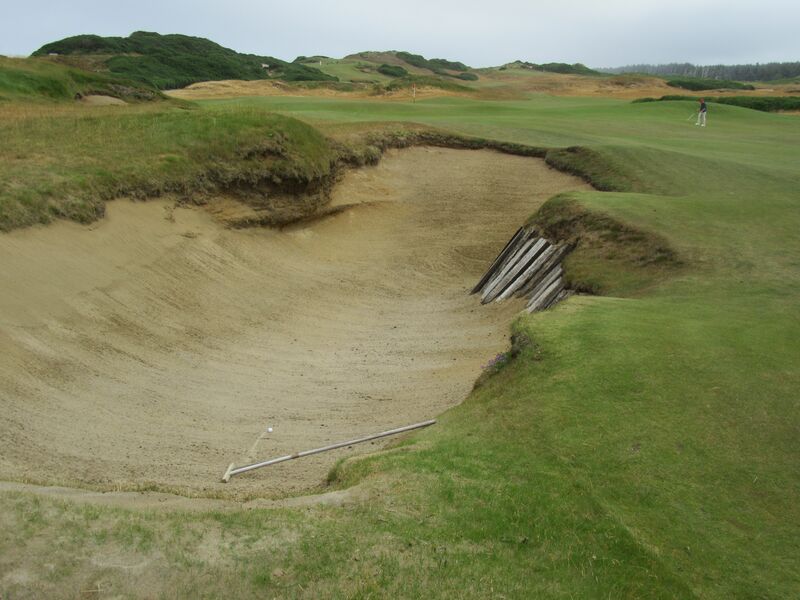 Either way, the sand traps along the corridor can come in to play, but they will be blind to the player whose approach shot is over the Alps sand dune. I found this trap off the tee on the right side of the fairway. I would not recommend this as a good route. 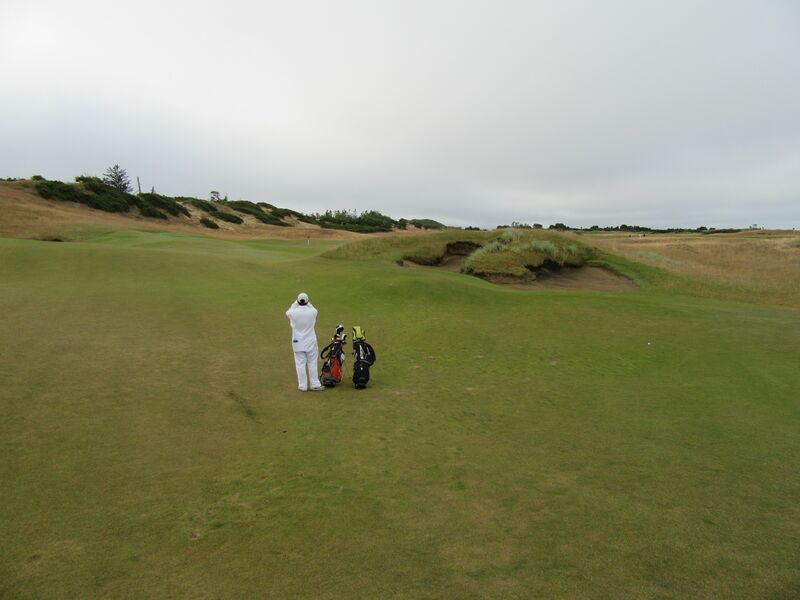 Make sure to ring the bell just off the backside of the green when leaving the sixteenth hole. 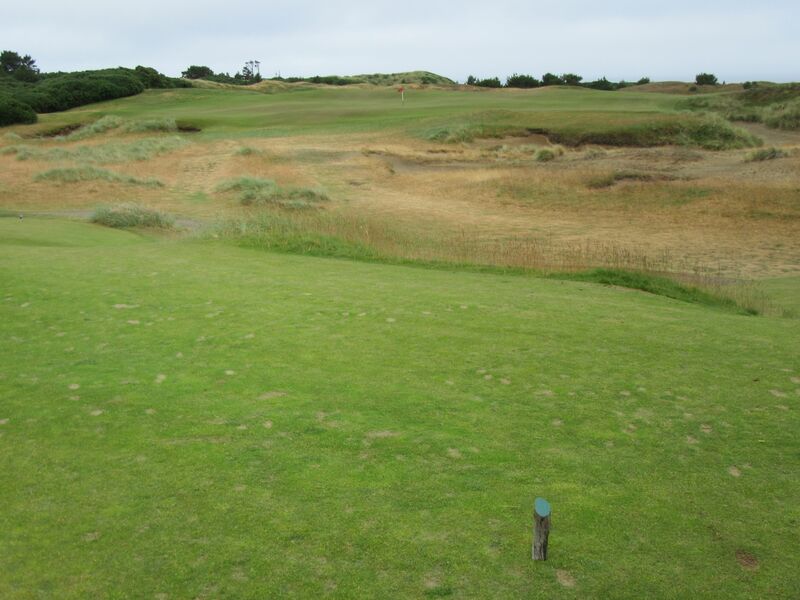 Another demanding par five, “Littlestone” requires a tee shot either to the left side of the fairway or else long to carry the wasteland to the right. Three out of four of us in our group were able to carry this area, mine only because of the wind at our back. 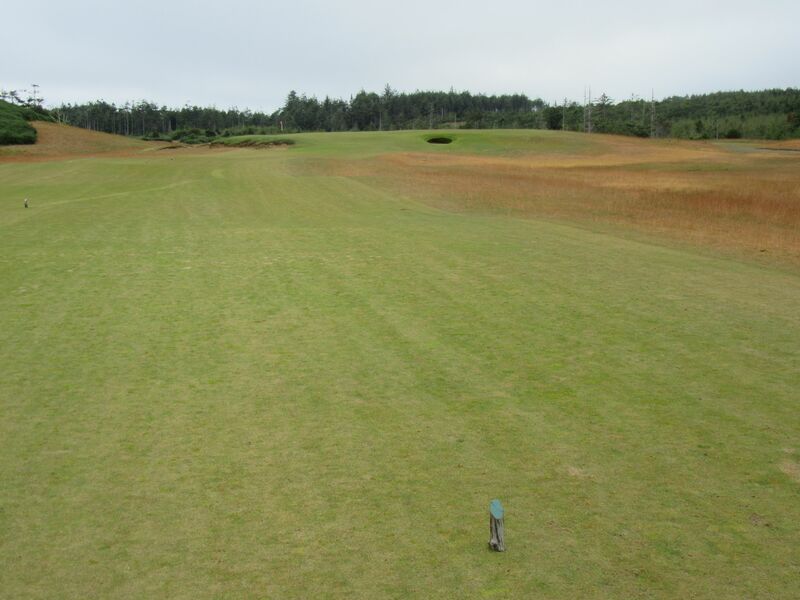 With the wind howling at our backs from the tee box, the 426-yard par four 18th was less intimidating than expected. 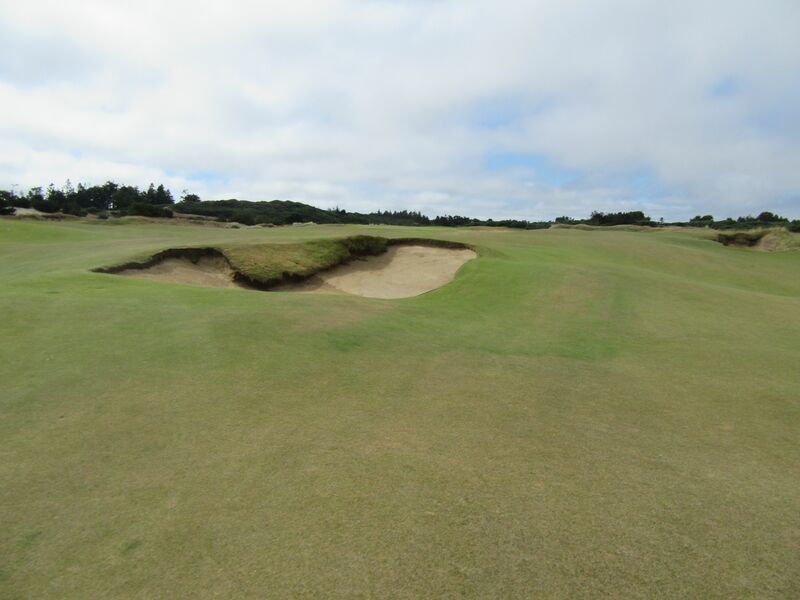 Fairway bunkers live all over on this hole, and the fairway veers from left to right to one of the most fun and accommodating greens on the entire course: The punchbowl. 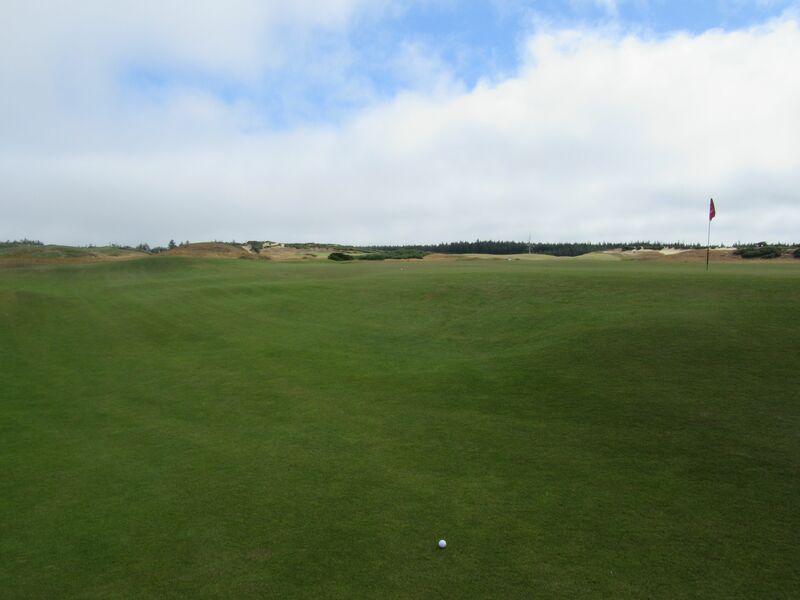 Find the fairway or anything like it, and hit straight for the pin as anything on the green will likely stay on it, and potentially even corral toward the hole location. 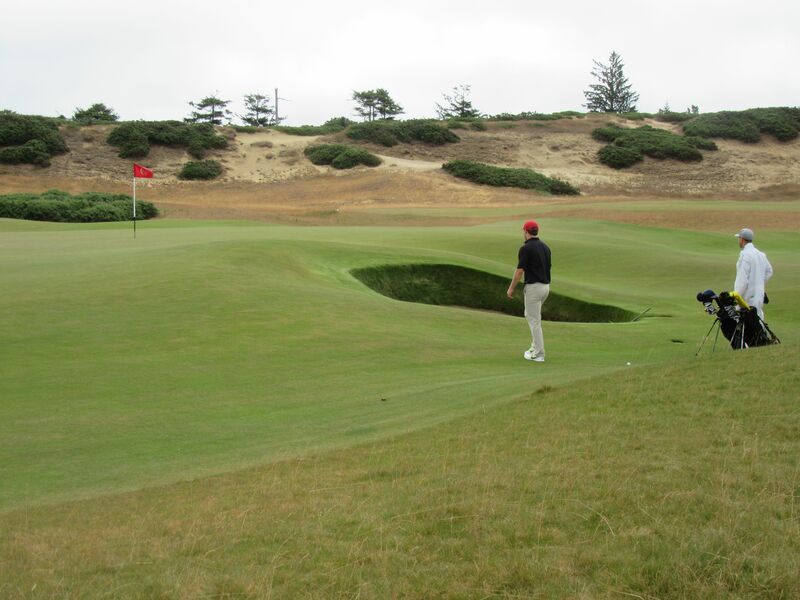 With a back-right pin, three out of four us of were within eight feet of the hole in two. 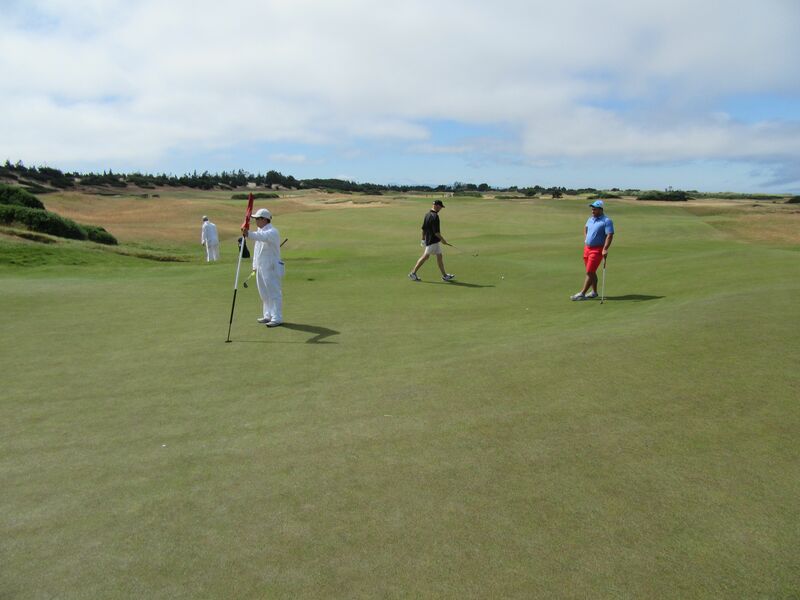 Greg and my caddie, Daniel, who was also with us on Bandon Dunes, told us one of my favorite stories of the trip: Andrew and Rick were caddied for by Mitch, who is a pretty big looking guy. Greg said to me the first time he saw him, “That guy would be a ridiculous enforcer in hockey.” He looked pretty big, but I wouldn’t have put him in the category of George Parros. Daniel said the two of them were looping for a couple of twosomes and one of his customers tried goading the two into a long drive contest. “I can’t – I don’t really hit the ball that far,” Daniel told them (Daniel’s obviously a phenomenal golfer [as well as caddie], himself), followed by Mitch informing them that he would break his driver if he tried to hit it. He didn’t believe him and wanted to see it. Reluctantly, he took one swing and snapped the driver. Turns out, Mitch used to perform on the long-drive circuits and Daniel says he’s had drives over 500 yards and hits his 5-iron 290. Beast. 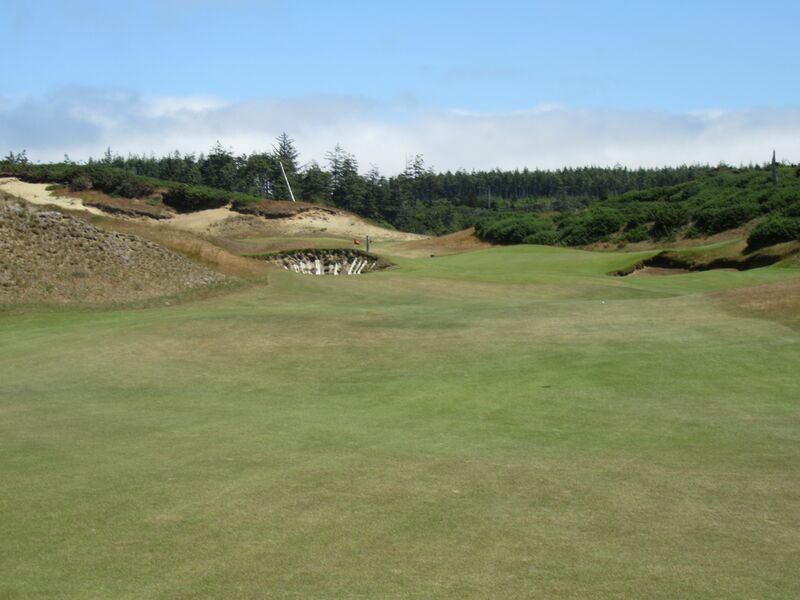 Of the four courses at Bandon, Old Macdonald is the one that I am most excited to hopefully get back to and play again someday. 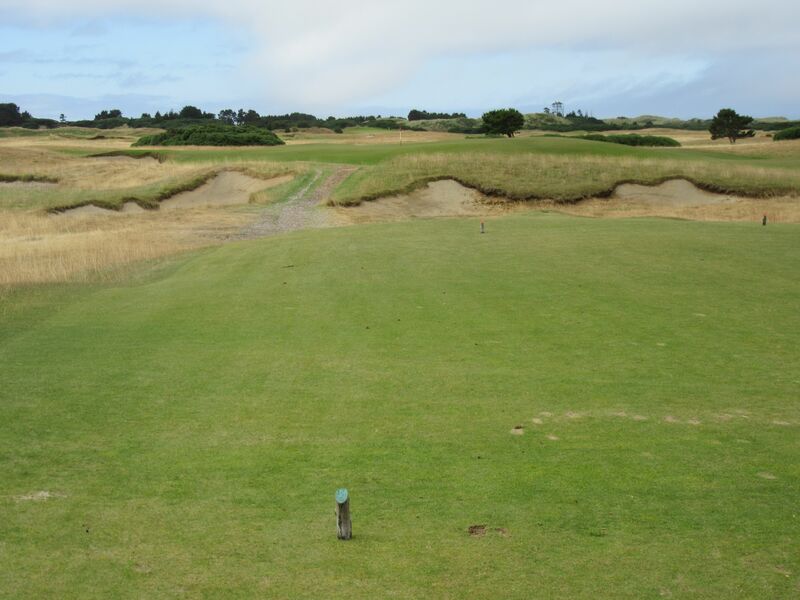 The other three are obviously tremendous and as good as anything I have ever played in their respective course type categories, but something about Old Macdonald, especially its playability and challenges, has me yearning to challenge it again (I also left quite a few shots out there!). 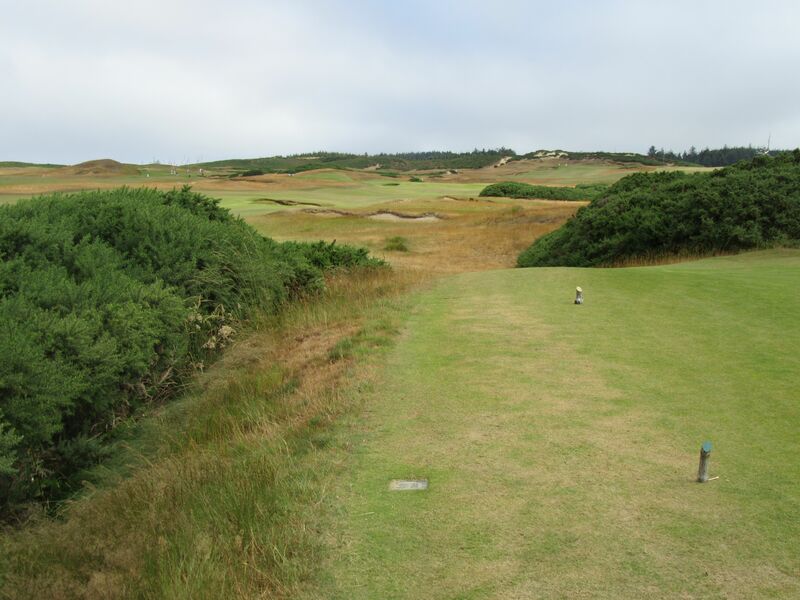 I would love to hear from you about Old Macdonald, and about the four courses at Bandon Dunes Golf Resort, in general. How do you rank the four? What are your opinions?